Janet, Claire and Gaynor have signed up to a 10 week course to aid fitness and well-being for people in the community who have or have had cancer. The course, which is free of charge, is organised in part by Lingen Davies Centre in conjunction with Shrewsbury Football Club. The first session took place at Ludlow Football Club on Thursday 21st March, and more members of Ludlow Cancer Support Group are planning to join the girls! 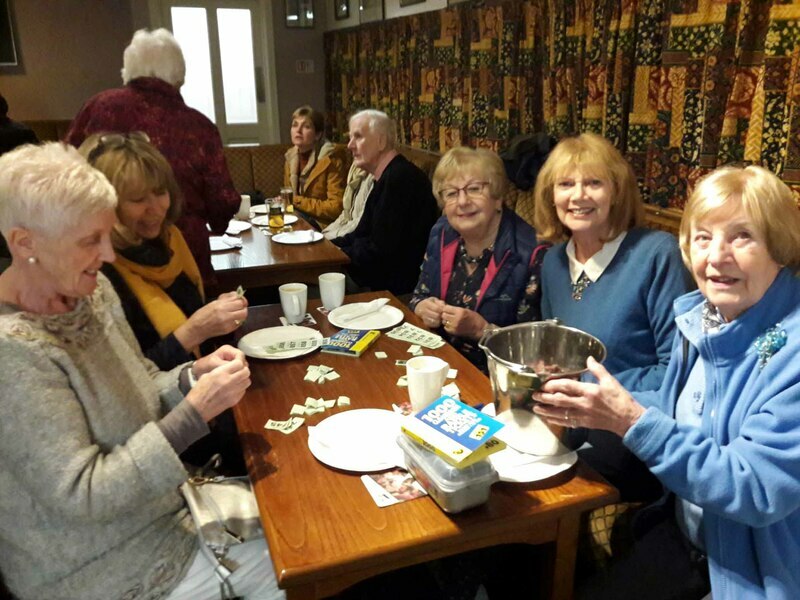 On Monday 4 March, 40 members, friends and supporters of Ludlow Cancer Support Group enjoyed a great evening, with skittles and a fish and chip supper. 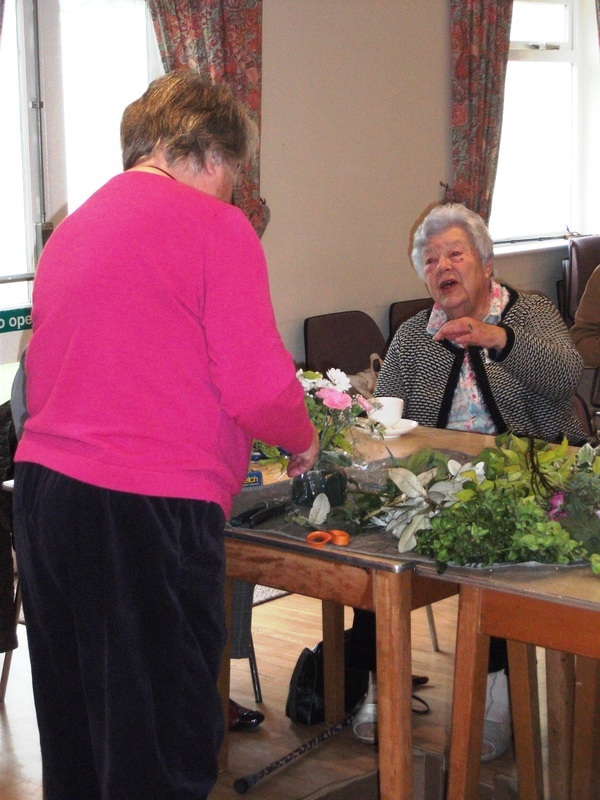 As ever, members thoroughly enjoyed creating their own flower arrangements, under the supervision of member, Mary Kirkby. 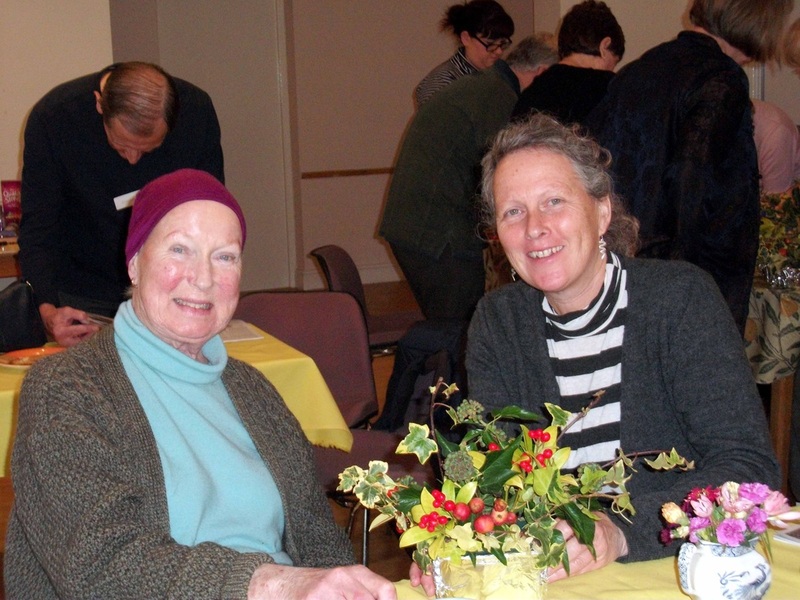 Ludlow Cancer Support Group is fortunate in that fellow-member, Rita Rogers always produces lovely table arrangements for every meeting (see our Christmas offering) and Frank Wood's work on Joan's Garden within Wigley's Field Allotments has simply stunning results. 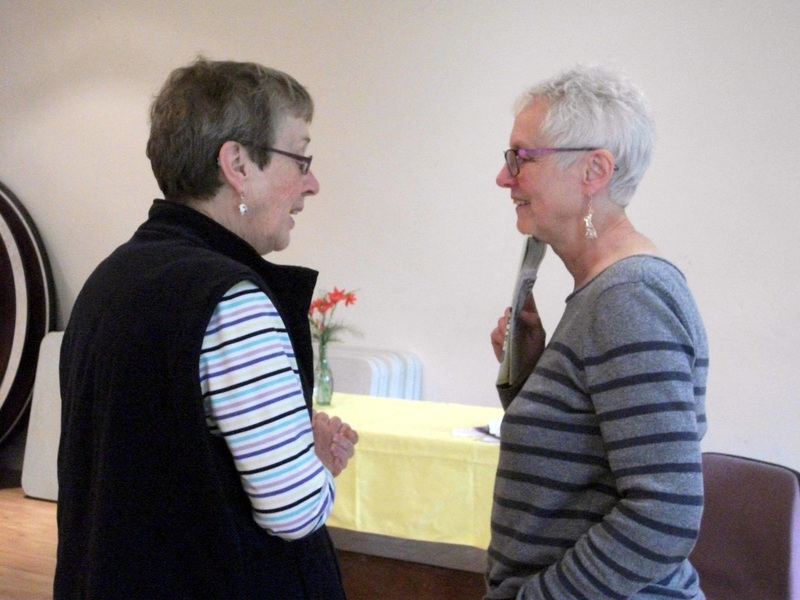 This was a great meeting, when emotional nutritional healer, Julie Slade; Reiki practitioner, Marilyn Gaunt; and Tai Chi instructor, Rose Jacks, talked about these essential and therapeutic disciplines. Discussion was enthusiastic, and it was apparent that a similar session should be held again next year. Julie will return on April 12th 2019, when she will show us how to make nourishing smoothies and a really healthy stir-fry. And whilst on the subject of nutrition, our lunch-time sandwiches, made by Lorna, are always both fantastic and healthy. 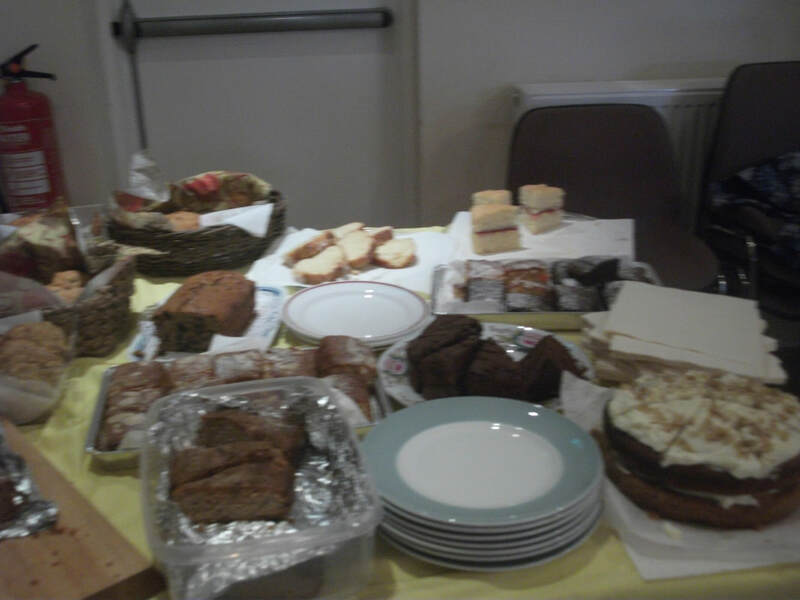 Home-made cake is provided at every meeting by Greg Farley, whose wife, Joan, was a founder member of Ludlow Cancer Support Group. 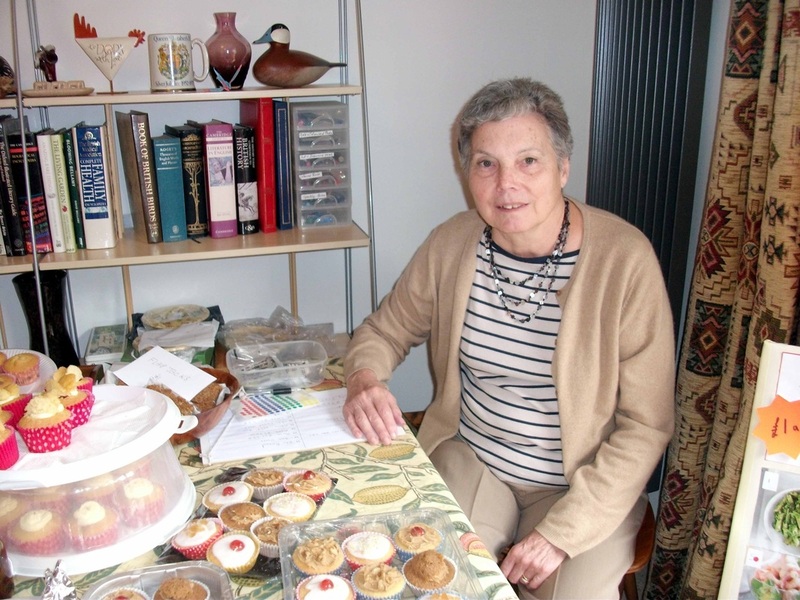 When Joan was diagnosed with terminal cancer, she taught Greg how to cook: his cakes are wonderful. 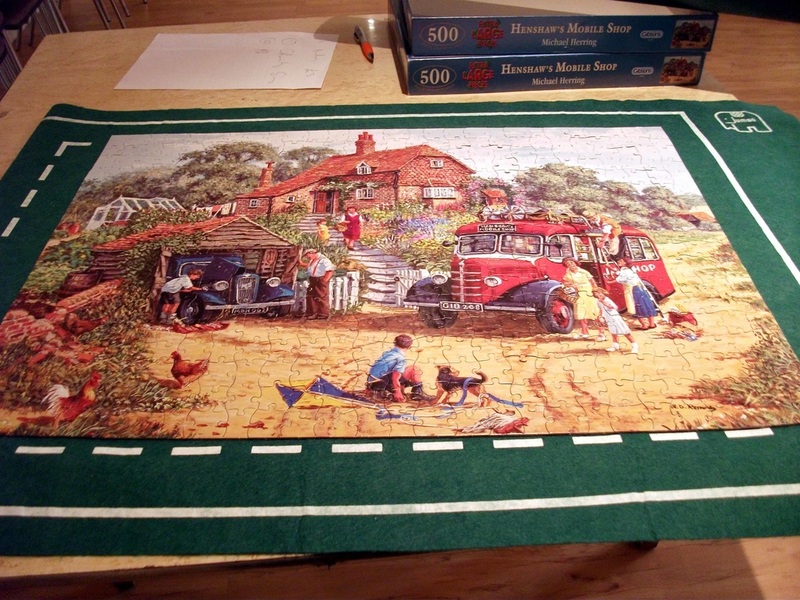 Painting, jigsaws, conversation and super sandwiches. This is our now-familiar end-of-year festival of songs, carols, readings and food. The songs and carols, requested by the members, just like on our "Singing for Fun" days, were displayed on the big screen. Readings were given by Rob Downes, Goff, Dori, Lou, Pauline and Howard. Everyone brought food and,as you can see from the photos below, it was a magnificent spread. 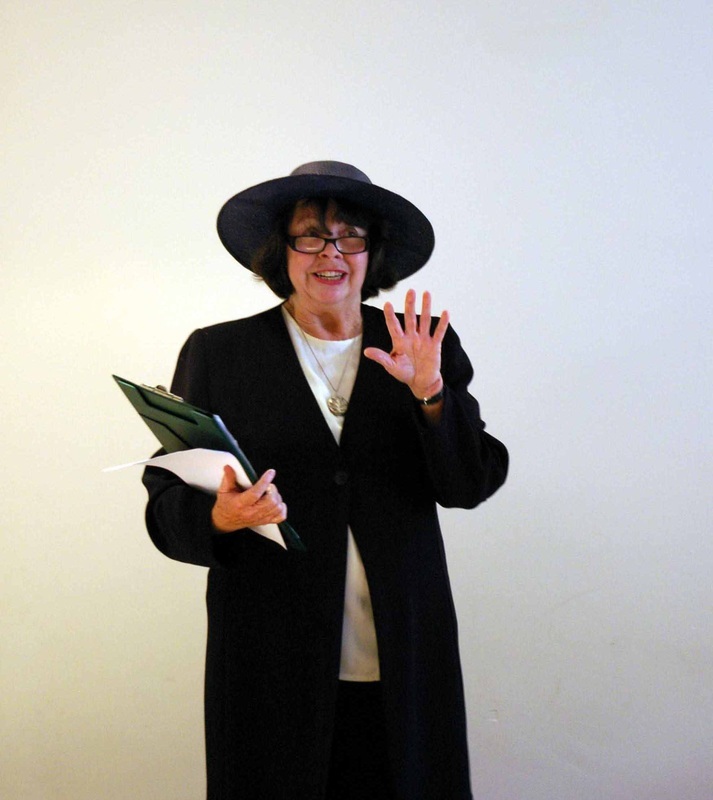 Alison Stemp, from the Macmillan Renton Unit at Herefordshire Hospital joined us, to demonstrate ‘The Power of Poetry’. 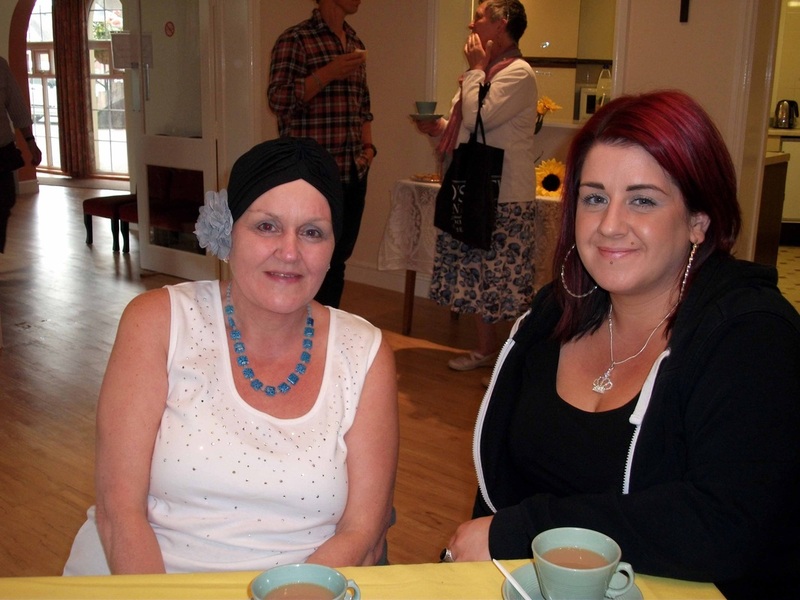 Alison has used poetry to help open up conversations around people's experiences of cancer. 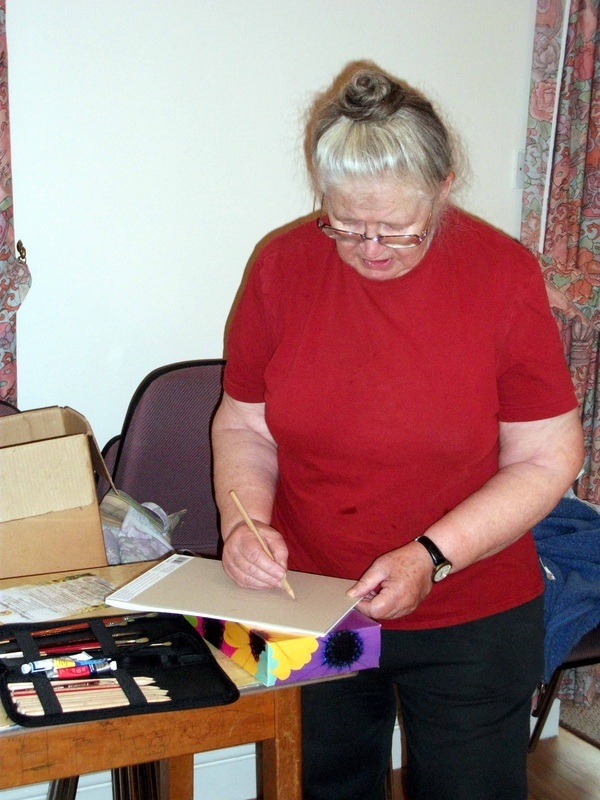 She will also bring along the “Ripples” poetry book that was produced as a result of a project with Brenda Reade-Brown, poet laureate for Gloucestershire, with cancer patients in Hereford. Rob’s story’s a fitting example of how opening up helped him cope, and also brought him and his wife, Sue, closer together. "I do believe, now having been through chemotherapy for advanced prostate cancer, that the emotional side of the illness is perhaps one of the most important aspects to consider and be open about. Having had a diagnosis, which in itself was a total shock to me, initially you just feel numb. It takes over your entire life and those around you often do not know what to say to you after the hugs and tears, as they too are somewhat bewildered. The person for me, who was my absolute rock, was my wife, Sue. Naturally she was very upset and worried as to what the future might hold, but through talking about the dreaded “C” word, we became incredibly close. 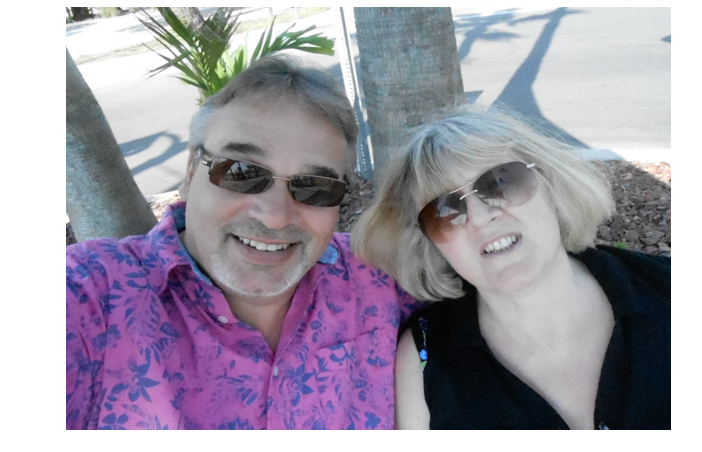 We had, just before my diagnosis, celebrated 40 years of marriage and had a fantastic month-long holiday in Florida. We then returned home to high PSA readings in my blood test (259) and were sent to the Macmillan Renton Unit in Hereford, where we were told the news that my cancer was already at stage 4. Scans and biopsies confirmed that I was going to need a high dose of chemotherapy as my cancer was “aggressive” and had spread. Throughout my treatment Sue, although stressed and anxious, remained focused on getting through it and was supportive throughout. Supportive is probably not the correct word, because she was much more than that to me. I think it was being able to tell her how I was feeling, physically, as the chemo wreaked havoc with my body, and what I was thinking on a day to day basis that gave me great comfort. Also, the way we decided to learn everything about my condition was a help and it was the route we decided on. Rather than be lying in bed at 4am, wide awake, pondering the “what if`s”, we always asked the Oncologist a lot of questions (we normally wrote a list, before the appointment) which he answered, so we were well informed which gave us a basis to talk things through. 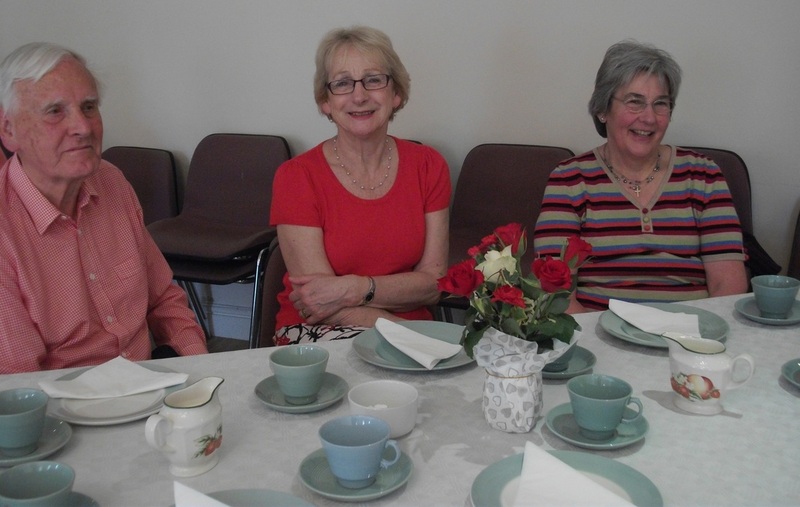 We always used to and have carried on, having a leisurely meal each Saturday night, catching up with the week`s events, or discussing my cancer, enabling us to know exactly how each other felt about it and how we were going to deal with my cancer, then and in the coming months. Sometimes, we would sit down to eat (not that I could taste much most of the time!) and not get up until 2 hours or so had elapsed. For me, this was invaluable, having someone who I could talk to and I think Sue felt the same. Speaking to family or friends, is, in most instances, just not the same because as well-meaning as they are, they simply did not know or, in some instances, understand what we, as a couple, were going through. Singing days start at 11.00, and are very informal. Howard plays a number of recorded songs, and you are invited to ‘sing along’, following the words on the screen. It is both uplifting and great fun – see attached photo of Steph and Suzie! Bring a friend and a plate of food to share. Pauline laid a wreath at the Memorial in Ludlow on behalf of the Ludlow Cancer Support Group. 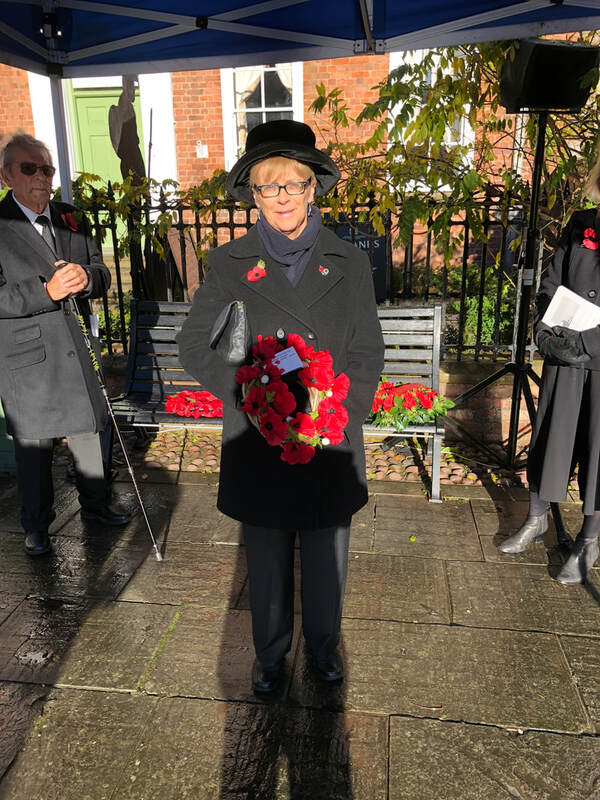 On the previous day a wreath was laid on behalf of the Group by the Deputy Mayor of Ludlow at the memorial at St. Leonards church acompanied by our Chairman Rosemary. I am sure many members will remember the talk Rob gave us before our summer break, when he touched on the emotional aspects of recovering from both a cancer diagnosis and the subsequent treatments and their physical impact. This morning, he invited members to discuss their personal feelings. The meeting was both emotional and amusing and finished with a unanimous request for ‘more of the same’ later in the year. 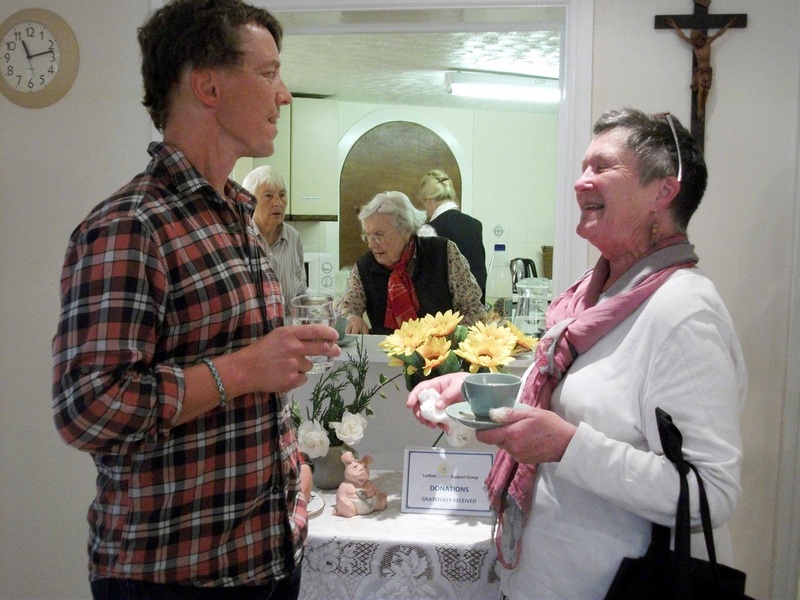 Rob’s original talk was one of the catalysts in setting up the LUDLOW CANCER SUPPORT BEFRIENDING GROUP. 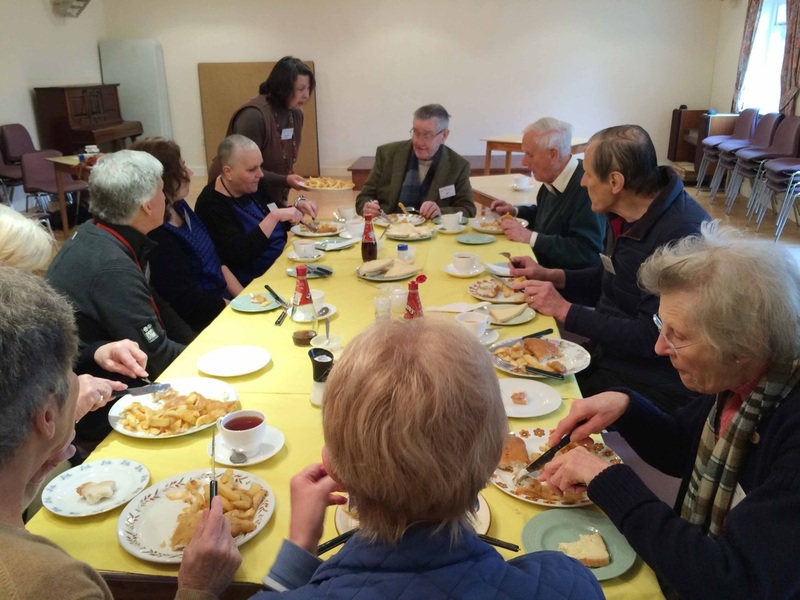 Discussion showed that there may be a need for individuals to talk on a ‘one-to-one’ basis about their feelings, and several members of Ludlow Cancer Support Group have offered to be a ‘Befriender’. This means if, during one of our meetings, you would like to talk, one of us will sit with you, quietly, privately and in confidence, and listen. Our thanks go to Rob Jones, leader of the Vintage Jazz Revival Band, and his musicians, who were just great. The Jazz night was a tremendous success, the highlight being Dori dancing, first with Lynda, and then responding charmingly to an invitation from Tom, to ‘take the floor’. 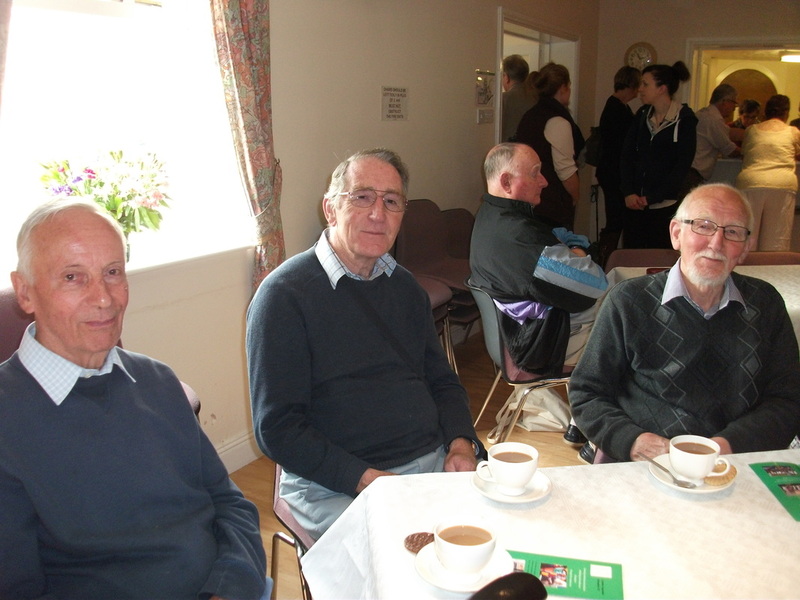 Around 75 people attended the Macmillan Coffee morning, and £310 was raised. 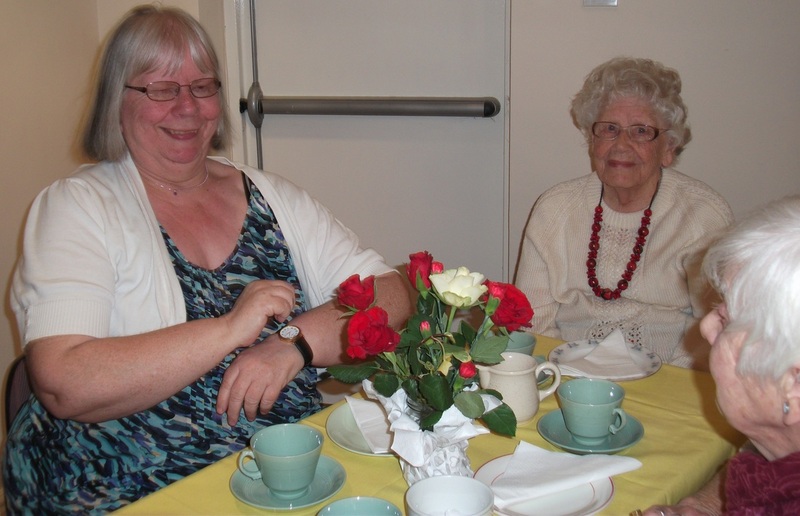 As ever, the event was great fun, with lots of laughter and conversation. We were all so busy making coffee and serving cake, we forgot to take any photos! So here’s one from last time. Admission will be £2.50, to include coffee and cake, and there will be a raffle. Please tell your friends, make a cake or donate a raffle prize! 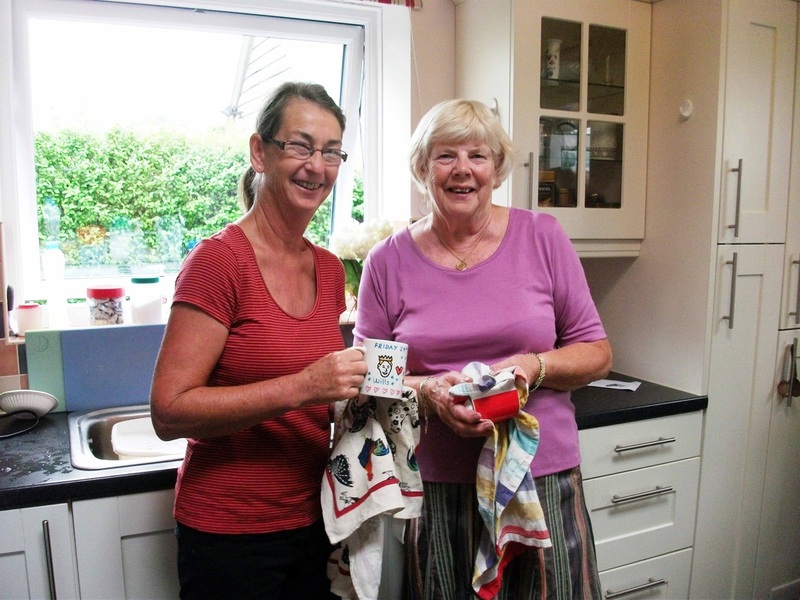 Lynda and Lesley will be i/c our Bring and Buy table, and whereas entry money and raffle proceeds will be for Macmillan, monies from the Bring and Buy will go towards LCSG funds. 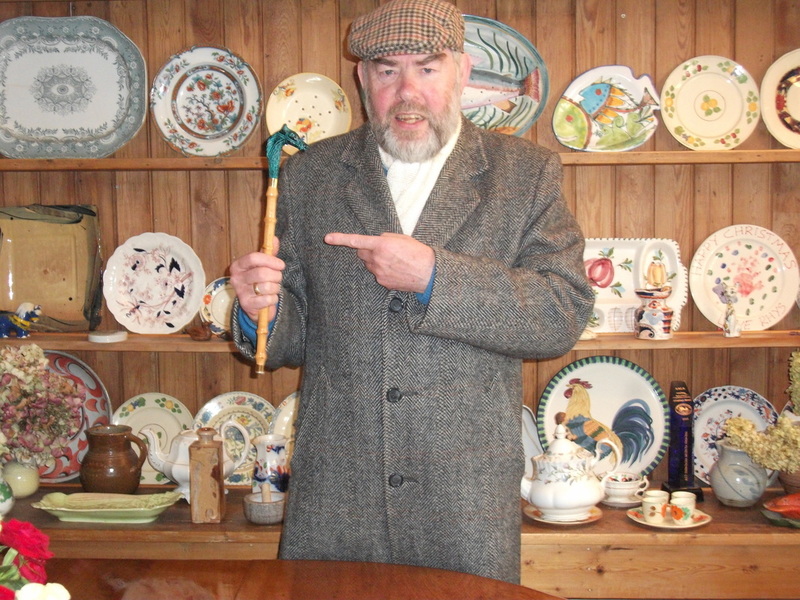 So come with your unwanted gifts and good quality bric à brac. Excellent meeting this morning, with painting and Anne Coe brought in some cotton knitting wool and several people made dishcloths. We'll sell them at the Coffee Morning! It threatened rain but remained a glorious evening when we were joined by our friends from the allotments in a feast of beefburgers, saucages, salads and puddings. The allotments kindly provided the barbecue and their Chairman Rob Jones took on the role of head chef and a great job he made of it. The photos below speak for themselves and our thanks to all the LCSG members present and the allotmenteers for making it a great evening. Our monthly opportunity to exploit our inner Rembrandts thanks to our tutor Bob Wallace. Allotments' Open Day during the Ludlow Green Festival. Ludlow Cancer Support group engaged ALKIE PONE to protect Joan’s Garden and our allotment from the undesirable elements our lady (?) scarecrow, Seraphina (sadly also known as Slack Alice) was attracting. Unfortunately, we didn't realise Alkie was an ex-professional protection racketeer with a drink problem - hence his name. 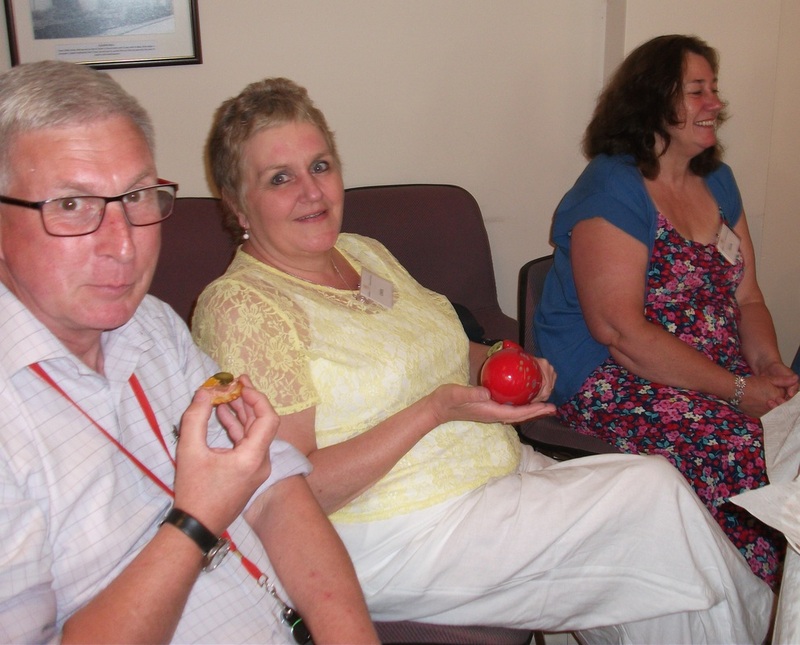 LCSG members were joined by colleagues from Wigley’s Field Allotments on Friday 8 June, to enjoy ‘Lunch in Joan’s Garden’. And doesn’t our Allotment look lovely? 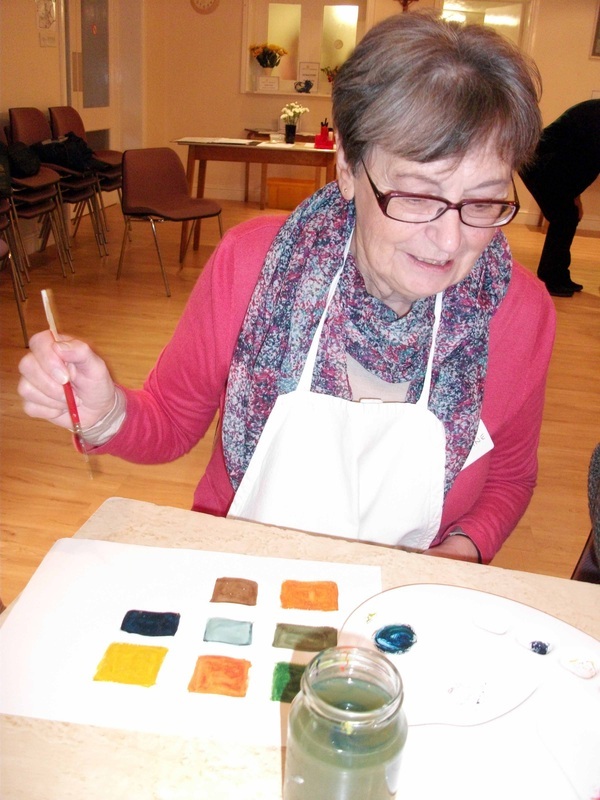 A great variety of paintings were chosen by our members and shown on the big screen with appropriate music. There was a big turnout for this event. The questions were topical but not easy, especially "parts of the human body". Great fun was had by all.and the winners are captioned. Frank Wood, who maintains Joan’s Garden and our Allotment, and two ‘special guests’ joined us for this combined talk and slide show; Howard described the history of Wigley’s Field; and Rosemary presented a short slide show of how the garden and allotment has progressed since we were given the opportunity of creating it in May 2016. 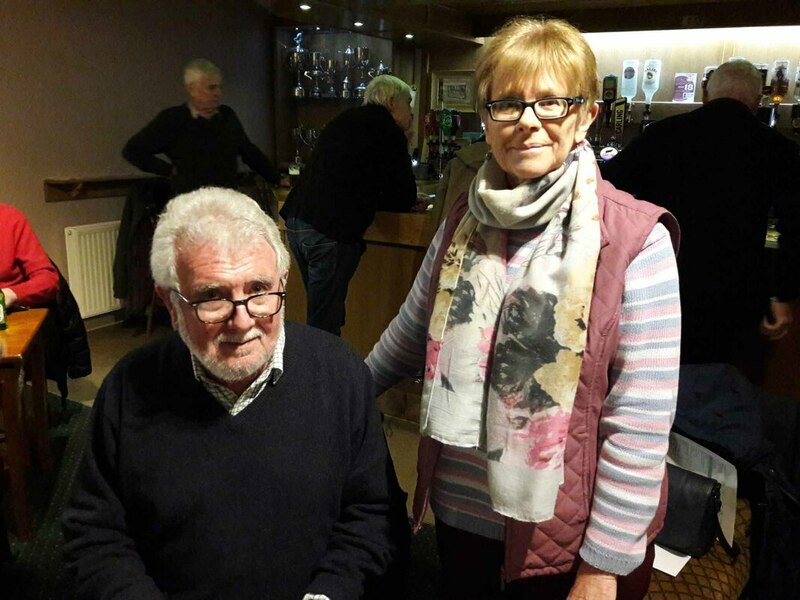 This was a great success, and our thanks go to Rita for arranging this evening at the Burway Bowling Club, and to the Club itself, which refused to charge us any room rental fee. 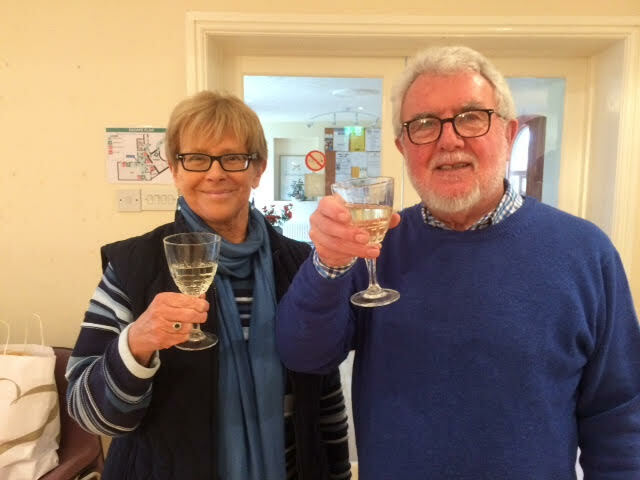 Although not staged as a fund-raising event, the evening raised £74, from the raffle organised by Claire and Gaynor, and from discounts on the Fish and Chips, given to us by ‘The Plaice’ in Lower Corve Street. The owners also delivered our food, and gave us two large bottles of Coca-Cola! We are so lucky to have the support of artist, Bob Wallis, and look forward to starting our 2018 season with painting. I am sure we will think of Dave, who so enjoyed these sessions. This is such fun. Led by Lorna Osborne, with technical expertise provided by Howard Goslyn, members have really responded to these sessions. 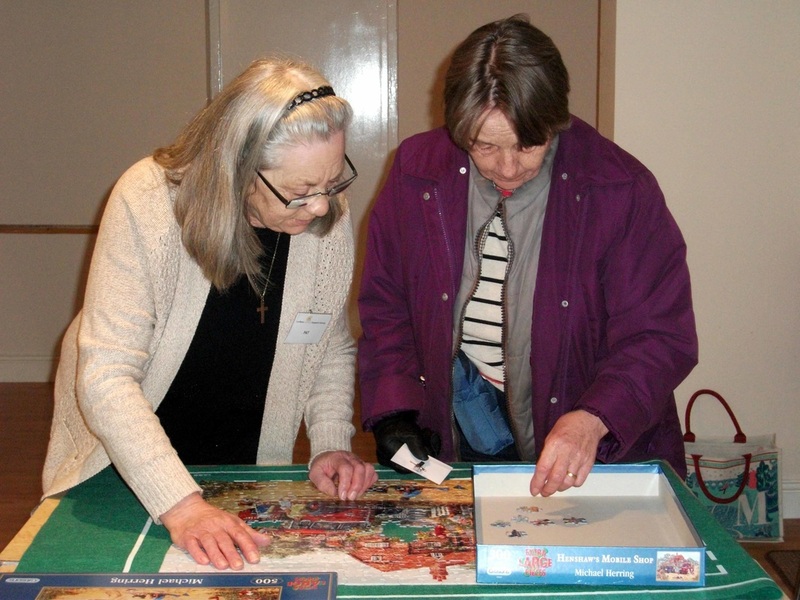 The emphasis is on fun and informality, and our meetings are intended for anyone affected by cancer, be they patients, carers, family, friends or those who have been bereaved. Members were encouraged to suggest activities for the 2017-2018 Programme of Events. 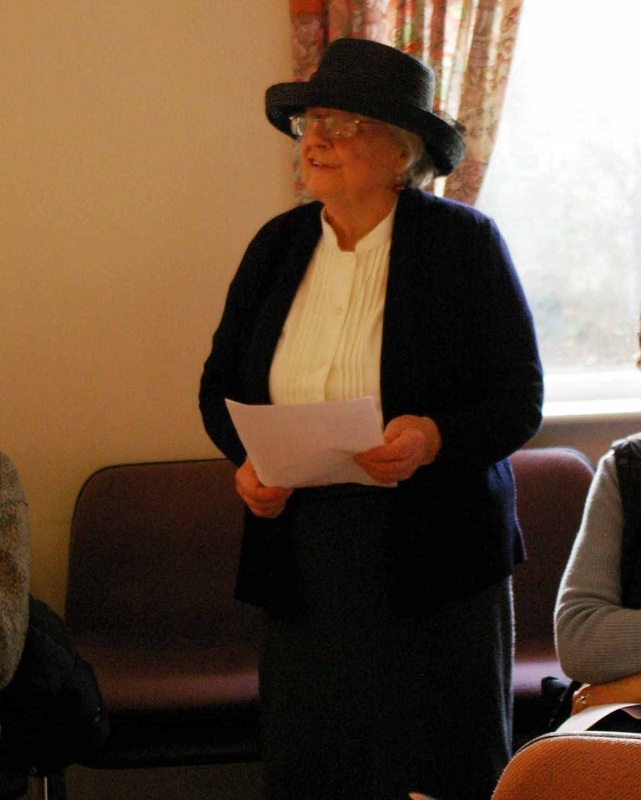 Ludlow Cancer Support Group’s Fashion Show in March was a sell-out and an outstanding success! 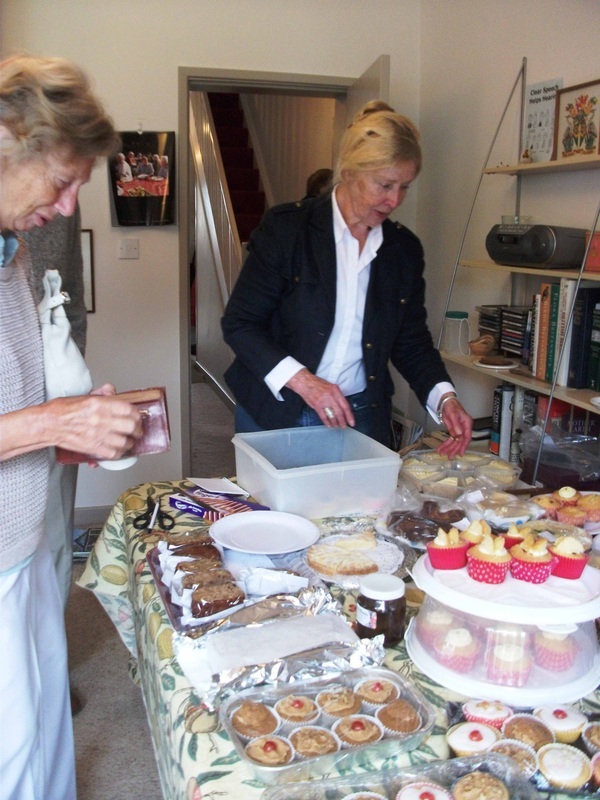 It was organised by members, Claire Taylor and Gaynor Lloyd, and raised £840.00. 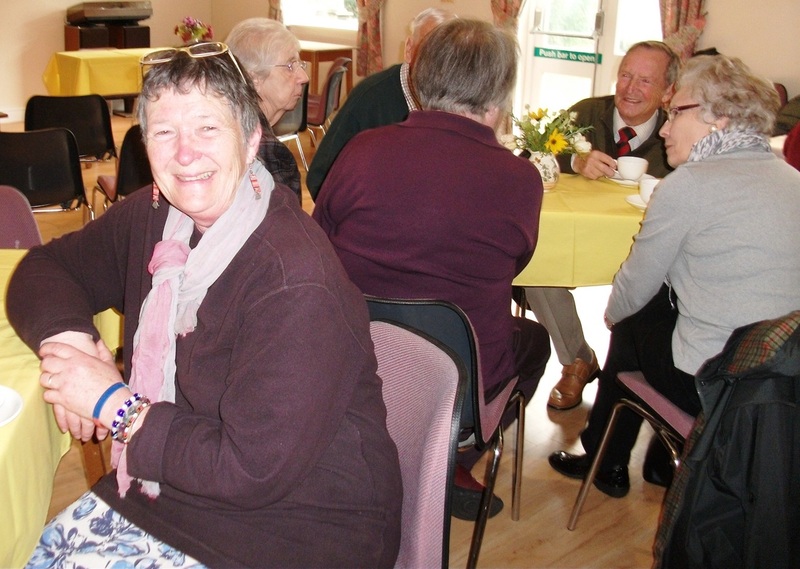 “Since our Group started in 2014, members have received a lot of support from the Lingen Davies Cancer Fund in Shrewsbury and the Macmillan Renton Unit at Hereford County Hospital”, said Rosemary Wood, Chairman of LCSG. “It was unanimously agreed that monies raised at the Fashion Show should be divided between these two organisations, and we rounded the sum up to £1000, so we can give them £500 each”. 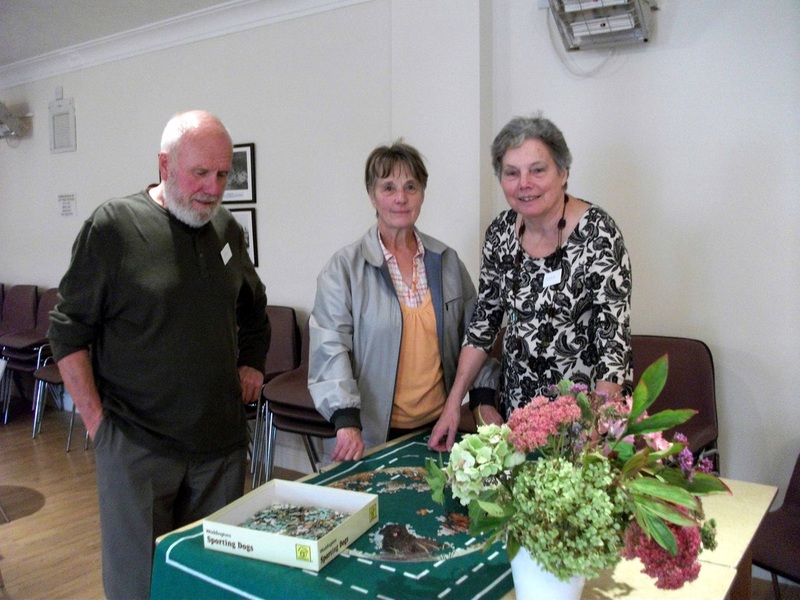 On Friday April 28, Ludlow Cancer Support Group members were delighted to welcome Moray Hayman, Macmillan Information & Support Specialist, and Jenny Goddard, Macmillan Area Fundraising Manager. Macmillan Information and Support Centres offer help on a confidential one-to-one basis. You don’t have to be a hospital patient to use these services, which provide information on health concerns, transport, finance, employment, grants, counselling and social services. Moray told members about ‘the Big Green Bus, otherwise known as The Mobile Information and Support Service (MISS). MISS is coming to Ludlow on Tuesday 13 June, and will park in Castle Square, outside Ludlow College. It is open from 10.00 am to 4.00 pm, and will be manned by highly skilled Information Specialists who can help with a wide range of clinical, financial, emotional and practical aspects of living with and beyond cancer. Macmillan Cancer Support has worked with Shrewsbury and Telford Hospital NHS Trust to develop the information centres at the Hamar Help and Support Centre in Shrewsbury, and the Princess Royal Hospital in Telford. 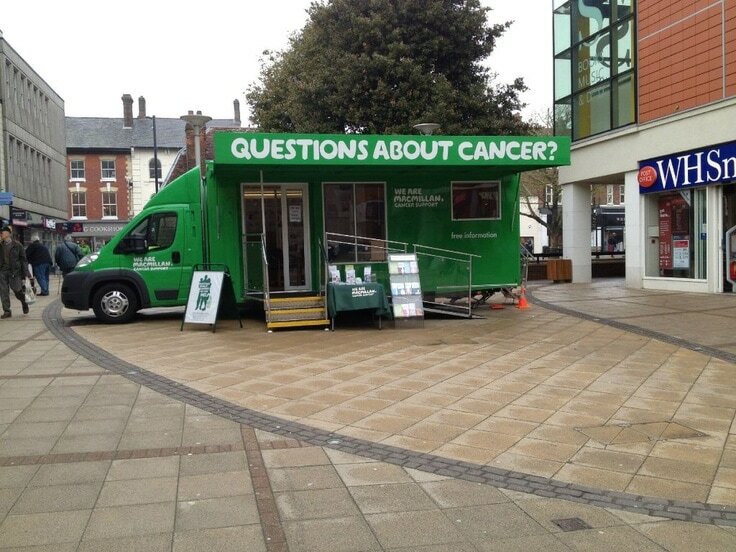 Each is staffed by a Macmillan Information and Support Manager and supported by trained volunteers, who can listen to how cancer is affecting your life and direct you to other sources of information and support. You don’t have to be a hospital patient to use these services, and you don’t need an appointment, but if you are making a special journey please ring to ensure the centres are open. Information is also available to carers. FASHION SHOW AN OUTSTANDING SUCCESS! Ludlow Cancer Support Group’s Fund-Raising Fashion Show was a sell-out and an outstanding success! The Fashion Show was the idea of two members, Claire Taylor and Gaynor Lloyd, who organised everything. The Group suggested the money raised should be divided between the Lingen Davies Cancer Fund and the Macmillan Renton Unit at Hereford County Hospital, and cheques will be sent out in due course. Both organisations have supported, and continue to support LCSG members. Committee member Lorna Osborne has kindly volunteered to organise our "Singing for Fun" group and we launched on our own on Friday the 17th. The turnout of enthusiastic singers bodes well for the future. Lorna started with some simple songs and rounds and then moved on to an on-screen karaoke version of The Byrds hit "Turn Turn Turn." This was followed by the Elvis song we performed with the Tenovus on the 24th of February "Falling in love" which had benefitted from the previous rehearsal on the 24th. Howard, who was operating the audio visual kit, requested that, as it was St Patricks Day, we should finish off by all singing "When Irish Eyes are Smiling." A great first session. 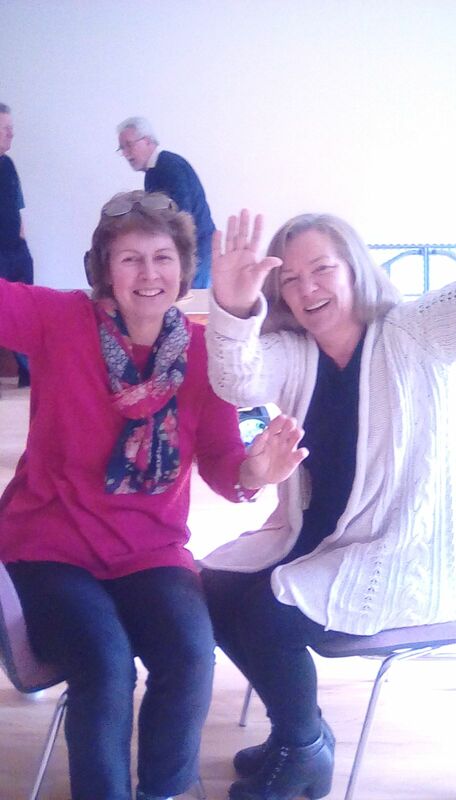 Claire and Gaynor are organizing the above Fashion Show and Pop-up Shop for the Ludlow Cancer Support Group. To be held on Wednesday 29 March in Oscars at Ludlow Assembly Rooms, this promises to be a really enjoyable occasion, with the opportunity to buy ex-High Street fashion at 50% less than retail prices. Clothes from M&S, Wallis, New Look, Oasis, Topshop and Next will be modelled (subject to availability) and a variety of accessories will also be on sale. Tickets cost £5, and we need your help to make this an outstanding success. So can you put the date in your diary, and start asking friends and family to do the same? 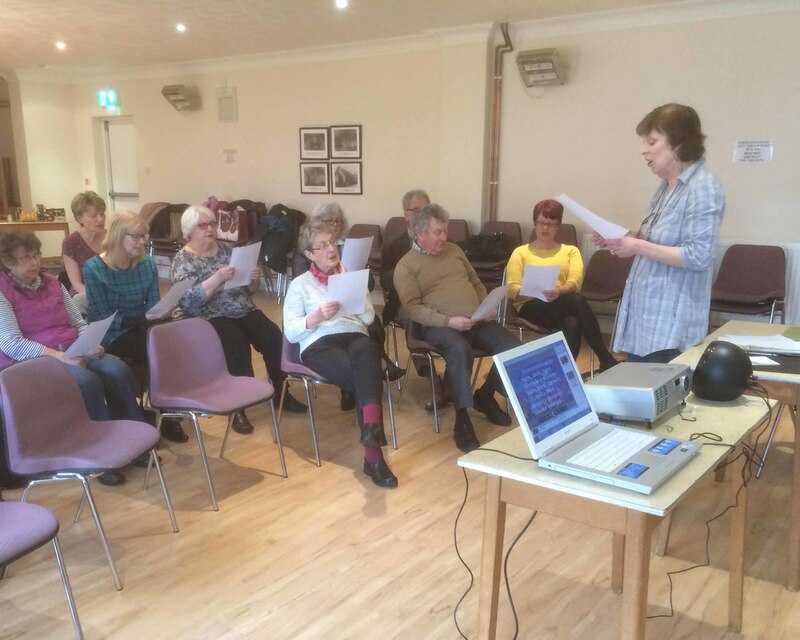 The Ludlow Cancer Support Group is joining forces with Tenovus Cancer Care to provide a “Sing with Us” choir taster session. 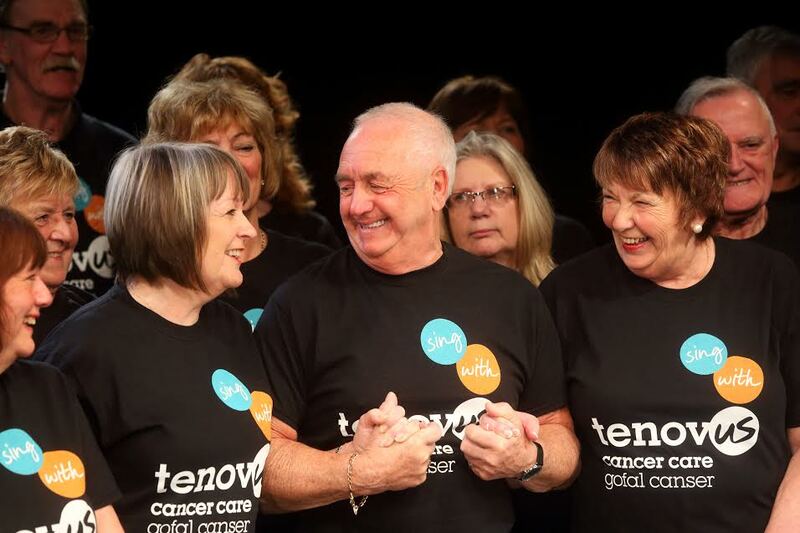 Welsh charity, Tenovus Cancer Care, runs nineteen “Sing with Us” Choirs across Wales and England with over 1,500 choristers turning up to sing each week. The aim is to provide support for anyone affected by cancer, be they patients, carers, family, friends or those who have been bereaved. 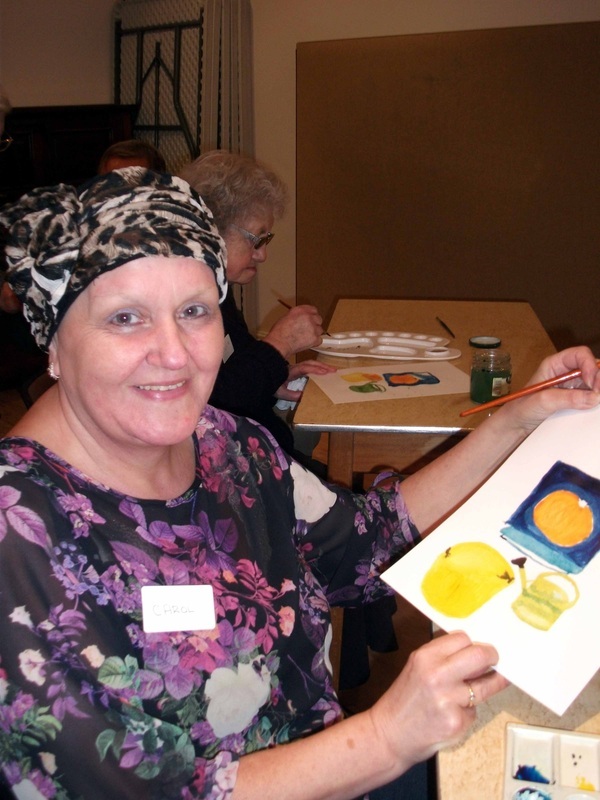 After learning about this research, the Ludlow Cancer Support Group contacted Tenovus Cancer Care. 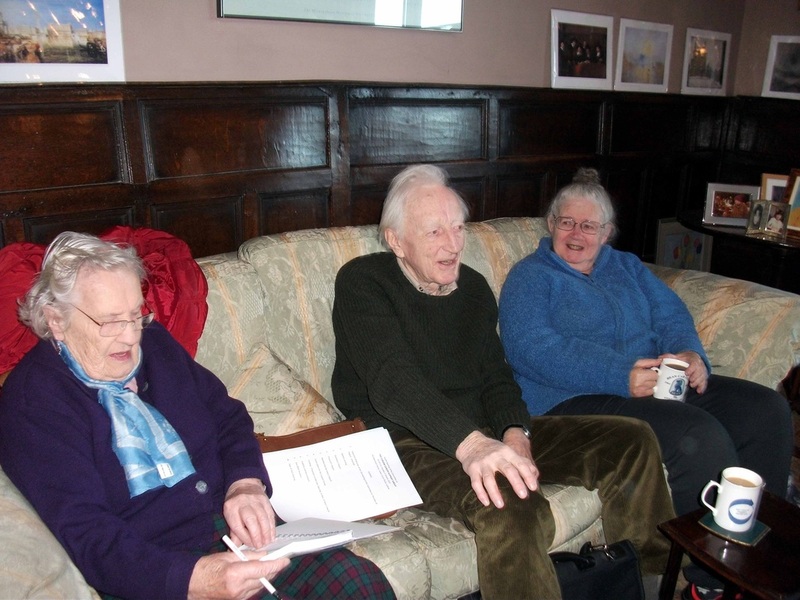 Both organisations are now in discussions regarding the possibility of creating a Ludlow Tenovus “Sing with Us” Choir. 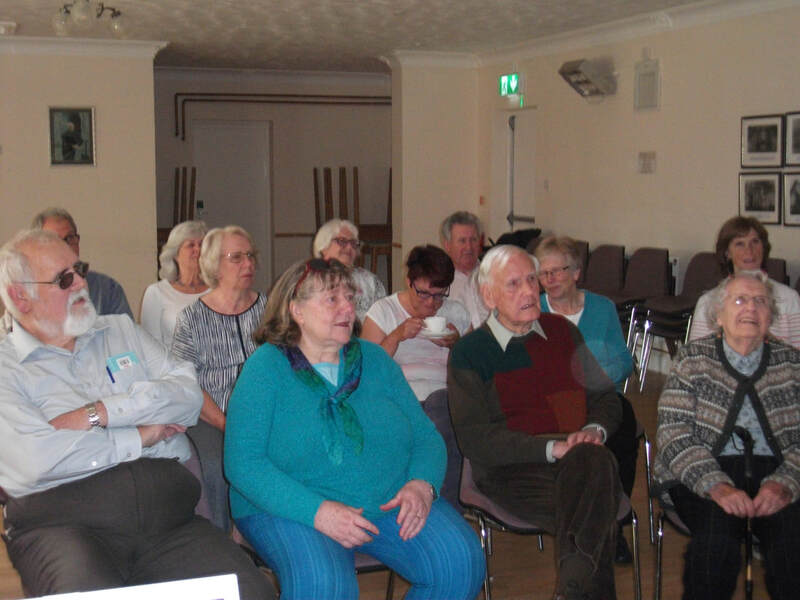 As a first step, a workshop has been arranged with Tenovus and some of their choir members to show the local community what a Sing with Us choir would look like and how it could help them. The taster session will take place on Friday 24 February from 11.00 - 12.30 in the Parish Room of St Peter’s Church, Henley Road, Ludlow. The session is free and open to anyone interested in the possibility of joining a Ludlow ‘Sing with us’ Choir. 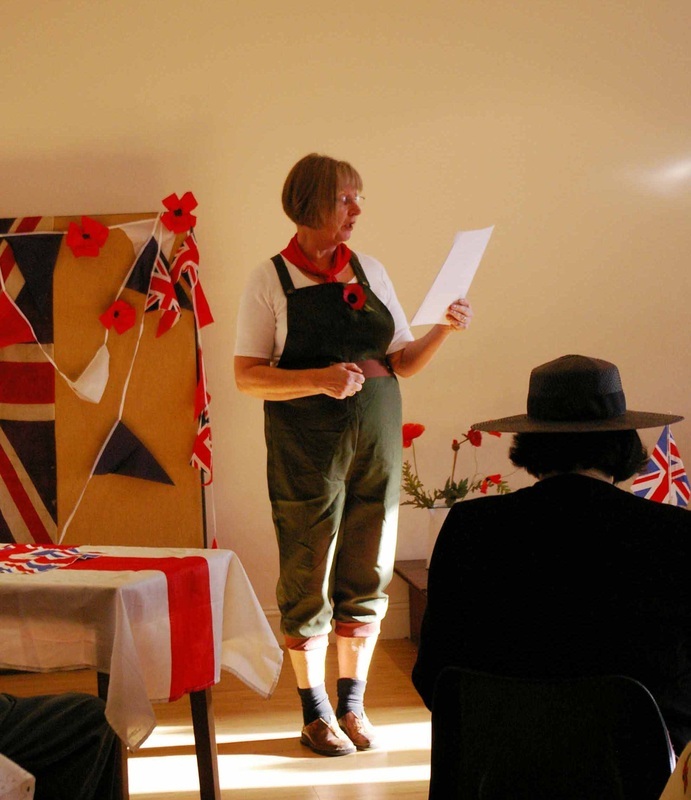 At the eleventh hour of the eleventh day of the eleventh month we held one minute’s silence followed by a poem by Pauline written by a First World War soldier who never came home. Howard played a song about Willy McBride who died in 1916 at the Somme, 100 years ago. The quiz was set by committee member Kim Holroyd who could not be with us on the day so the quizmaster role fell to Howard. The members were divided into teams of three and suffered through questions on Maths, History, Science, Food and People. The winners with the highest score were Lorna, Dori and Linda, however there was little difference between the teams with Rosemary, Tom and Dave collecting the wooden spoon by half a point. 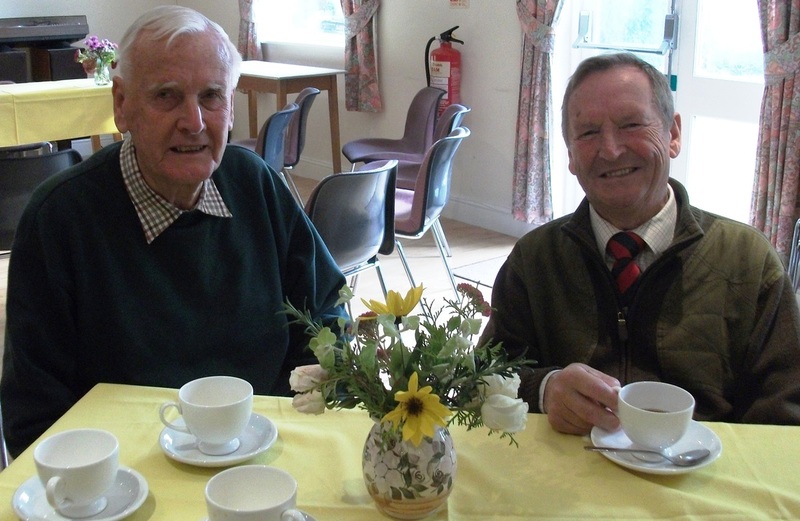 One of our members Kenneth Westwood gave us a fascinating talk on a day he will never forget. 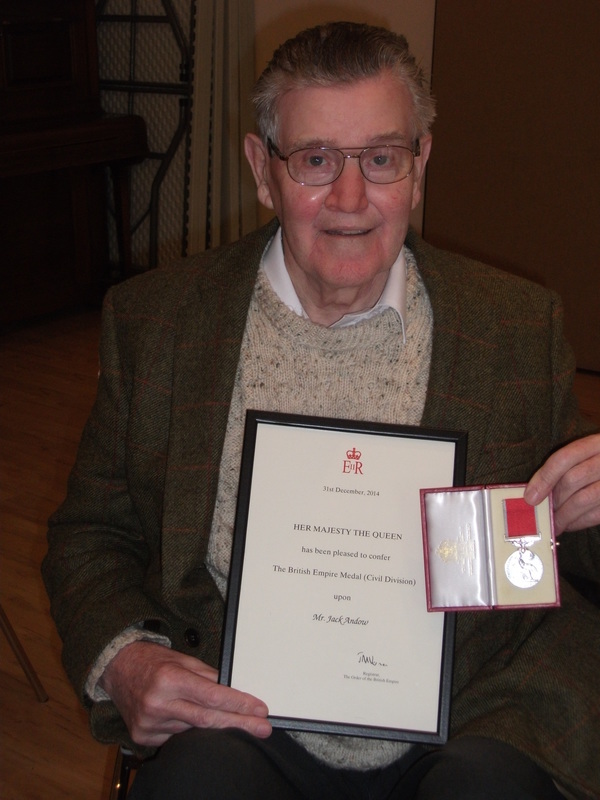 Ken began by telling us what life was like for a young policeman in London in 1952. He reminded us of the fogs and “smog” before the Clean Air Act and the limited communications that prevailed before the mobile ‘phone age. He talked about the police box, best known today by everyone as Dr Who’s tardis. A police box was a British telephone kiosk or callbox located in a public place for the use of members of the police, or for members of the public to contact the police. Unlike an ordinary callbox, its telephone is located behind a hinged door so it can be used from the outside, and the interior of the box is, in effect, a miniature police station for use by police officers to read and fill out reports, take meal breaks, and even temporarily hold prisoners until the arrival of transport. Ken had come off duty after a double shift and was going to bed when the call came for every available policeman to attend what was to become Britain’s worst train crash ; hence the title of the talk “ A day to remember”. The Harrow and Wealdstone rail crash was a three-train collision at Harrow and Wealdstone station in London during the morning rush hour of 8 October 1952. 112 people were killed and 340 injured (88 of these being detained in hospital); it remains the worst peacetime rail crash in the United Kingdom. An overnight express train from Perth crashed at speed into the rear of a local passenger train standing at a platform at the station. The wreckage blocked adjacent lines and was struck within seconds by a "double-headed" express train travelling north at 60 mph (97 km/h). A subsequent Ministry of Transport report on the crash found that the driver of the Perth train had passed a caution signal and two danger signals before colliding with the local train. The reason for this was never established, because both the driver and the fireman of the Perth train were killed in the accident. The accident accelerated the introduction of Automatic Warning System – by the time the report had been published British Railways had agreed to a five-year plan to install the system that warned drivers that they had passed an adverse signal. Ken was involved for the whole of the day collecting the belongings of dead and injured passengers and it was a gruesome task. It was a long time before he could sleep normally and he still has flashbacks today. Below are press photos of the crash. Burway Bowing Club was the venue for a very enjoyable and entertaining evening. 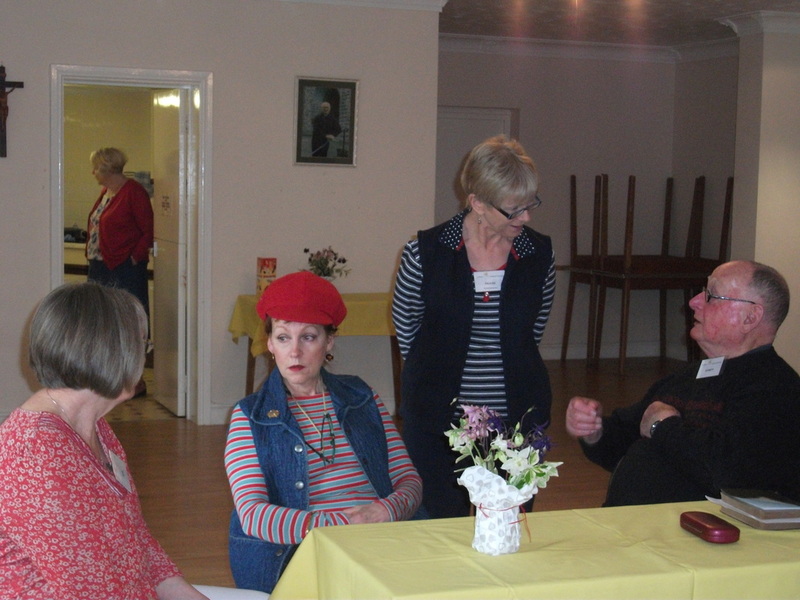 As well as 16 members of the Cancer Support Group there were 10 of their supporters (spouses and guests). 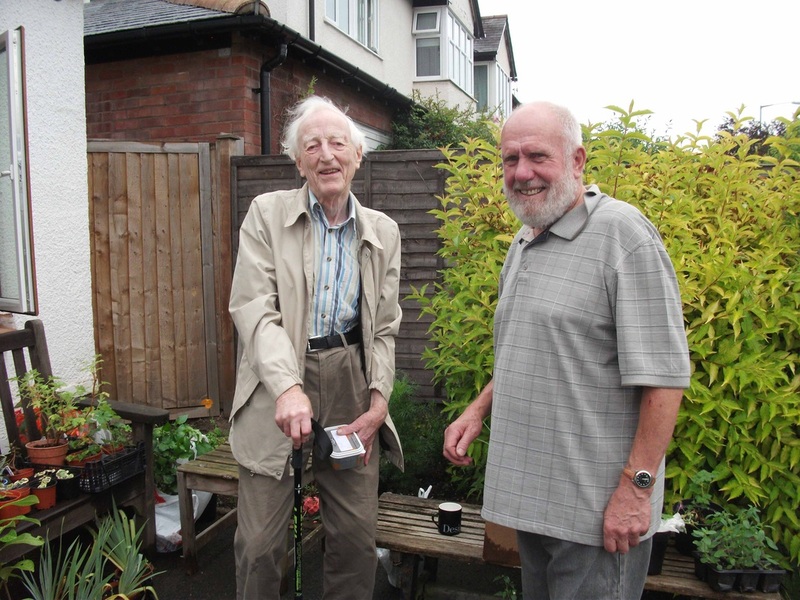 Additionally we were delighted to be supported by12 members and guests from Wigley Fields Allotment Association where we now have a memorial garden. 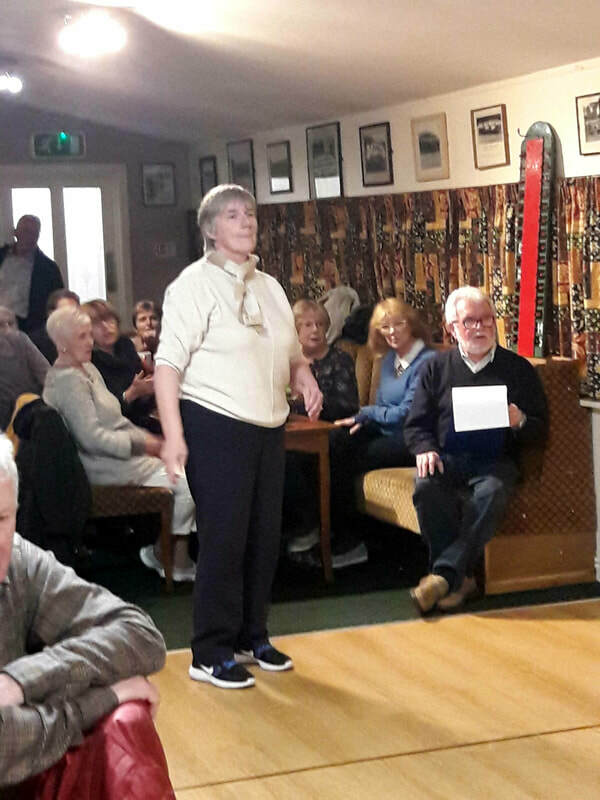 Committee member Rita Rogers arranged everyone into 4 teams of bowlers while husband Laurence acted as official score-keeper; meanwhile Chairman Rosemary was in the kitchen preparing dinner. The value of teams is the mixing, bonding and badinage which ensues, especially when someone misses all the skittles. 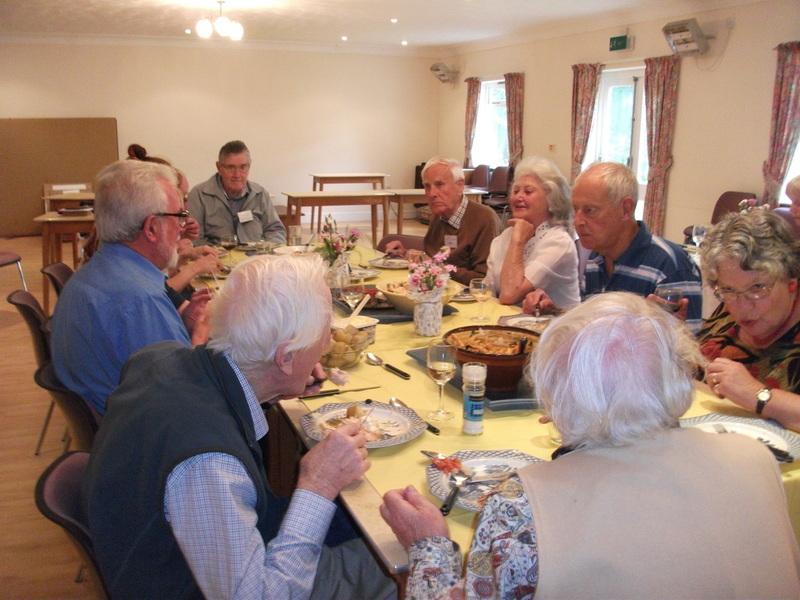 The first round of skittles was followed by dinner of vegetarian or chicken casserole with rice all home made by Rosemary; and by the preponderance of “cleaned “ plates, was much appreciated by all. The second course was fruit and cream followed by cheese and biscuits and coffee. The bartender did a roaring trade. The second round of skittles was as hilarious as the first with loud vocal encouragement. In the final event team C won the team round but overall individual score went to Greg Farley from team 4. 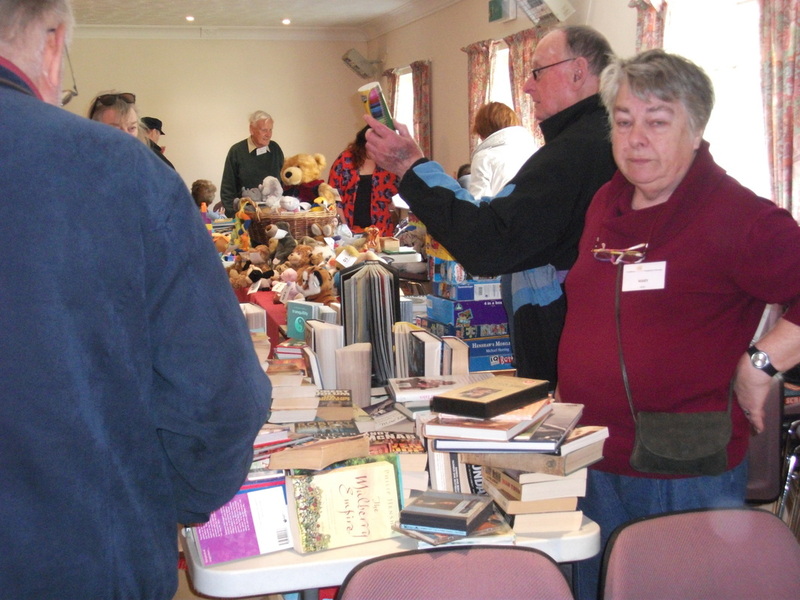 The raffle, as always, was well subscribed and is a constant addition to Club funds. 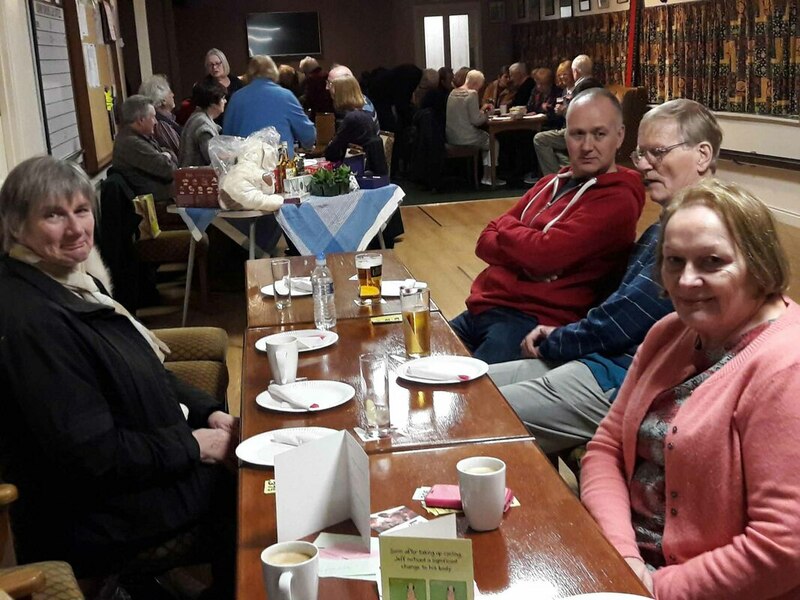 Our thanks go to everyone who supported the evening with a special thanks to Rita and Laurence for organising the venue and the skittles competition. 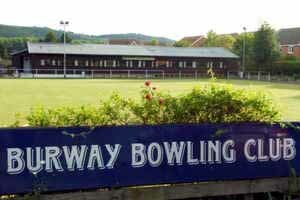 We owe a big thanks to all those who served the meals and washed up and to the Burway Bowling Club for the use of their venue and bar. Last, but not least, our thanks to Rosemary for the mammoth task of preparing and cooking dinner. PS Your Webmaster was tasked to take photos of the evening and in the midst of all the jollity completely forgot to do so. I give you my sincere apologies for that. Still I hope it won’t take anything away from what was a special evening. LCSG member, Dave Bissell, has once again single-handedly raised an amazing amount of money for the Group! 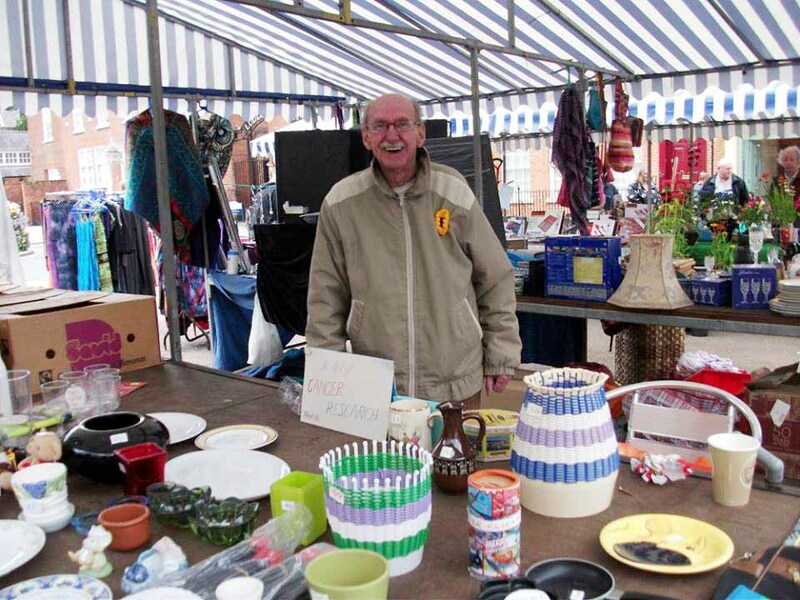 For the second time in a matter of weeks, Dave rented a stall in Ludlow market and sold bric a brac and collectables, raising the amazing sum of £411! Thank you, Dave – we really do appreciate your support. 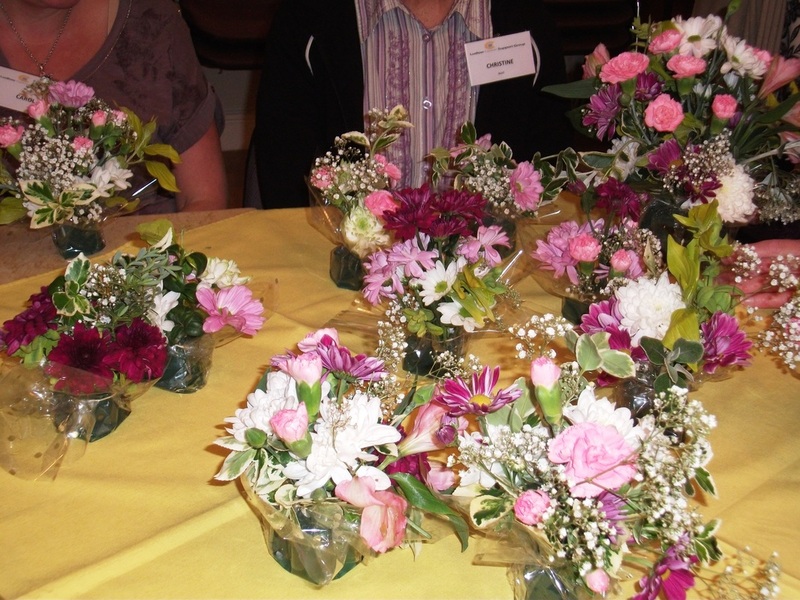 In addition to receiving such a generous donation, club members were also treated to a wonderful instance of flower arranging. 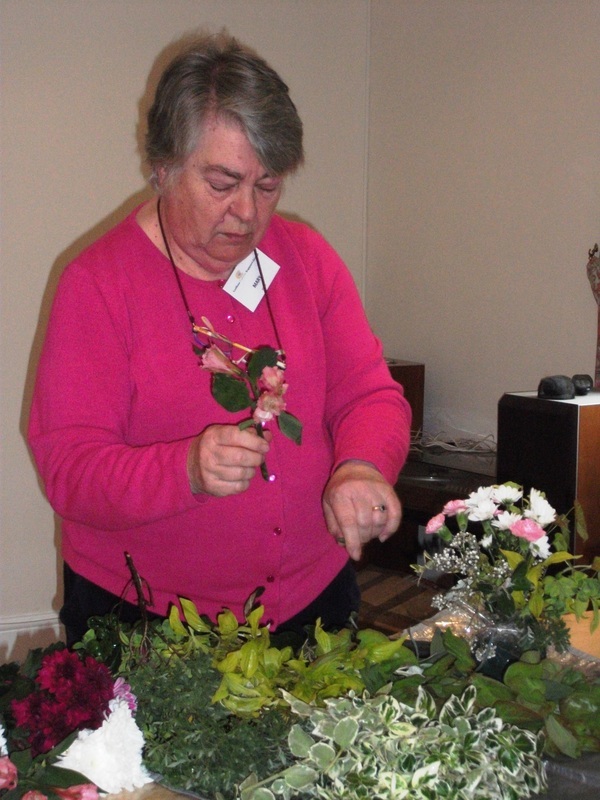 Member Mary Kirkby once again demonstrated how seemingly easy it is to create the most wonderful flower arrangements, using a few shop bought flowers or home-grown specimens from our gardens. But we’re not deceived, Mary – we know you are very clever! The importance of putting yourself first! 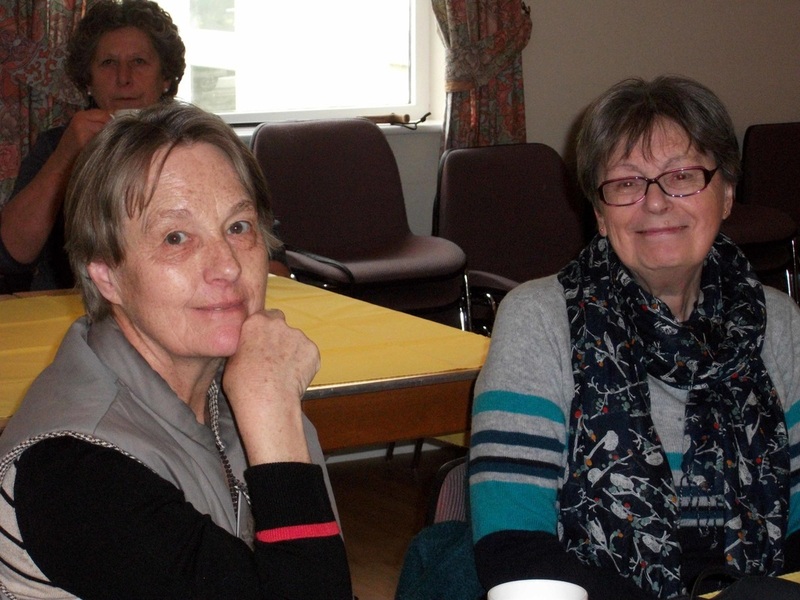 Most of us hesitate to ‘put ourselves first’, but Linda Downey, who has worked in the healthcare service , spoke to the group about the very real benefits of doing things which give us pleasure. 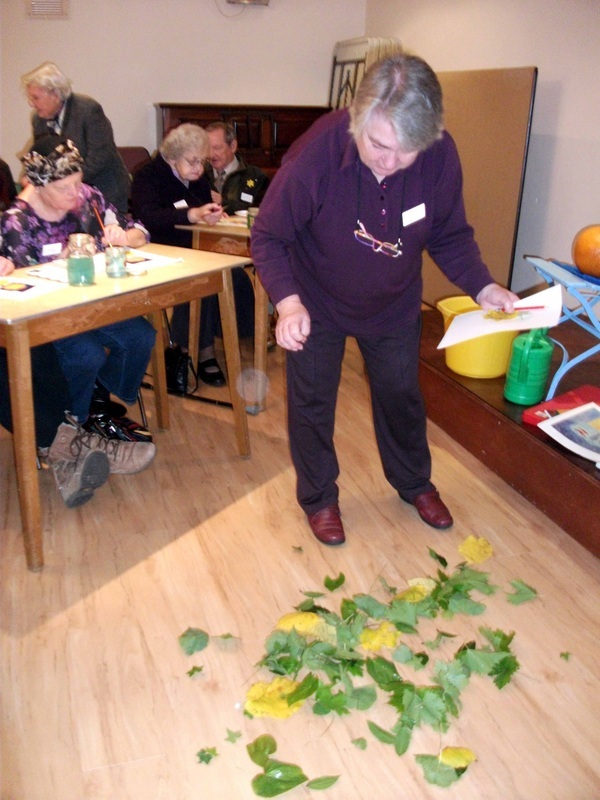 We learnt that simple activities which make us happy, such as being in the garden or enjoying a stroll, contribute positively to better health. Equally, watching programmes with violent outcomes, or reading stressful and disturbing news items, produces negative vibes. This seems obvious, but the thrust of Linda’s talk was – put yourself first, do what you enjoy, not what you feel you should, and the resulting sense of wellbeing will be both constructive and upbeat! On Sunday 18 September, the Group supported the Ludlow Cycling Festival, when more than 300 cyclists set off throughout the day from Ludlow Rugby Club. 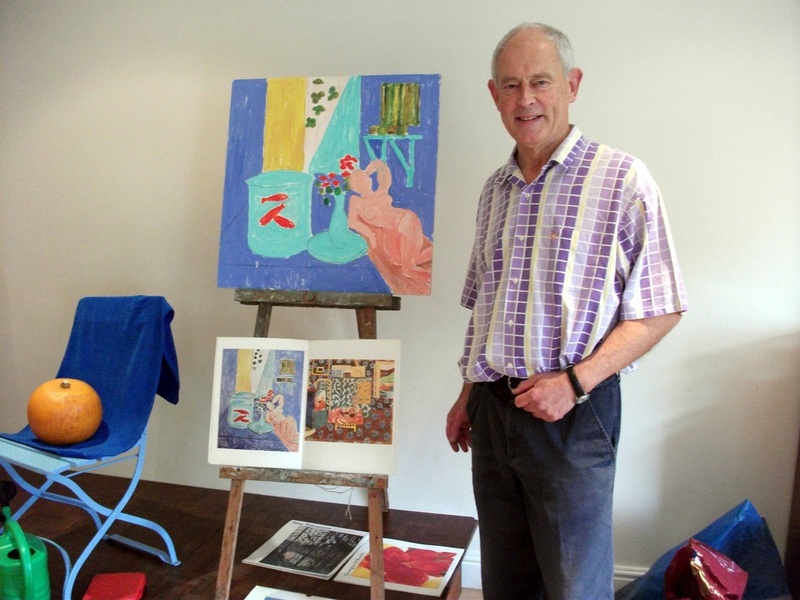 The highly successful event, in aid of Macmillan Cancer Support, was organised by Ludlow resident Ashley Green, who has himself suffered from cancer. 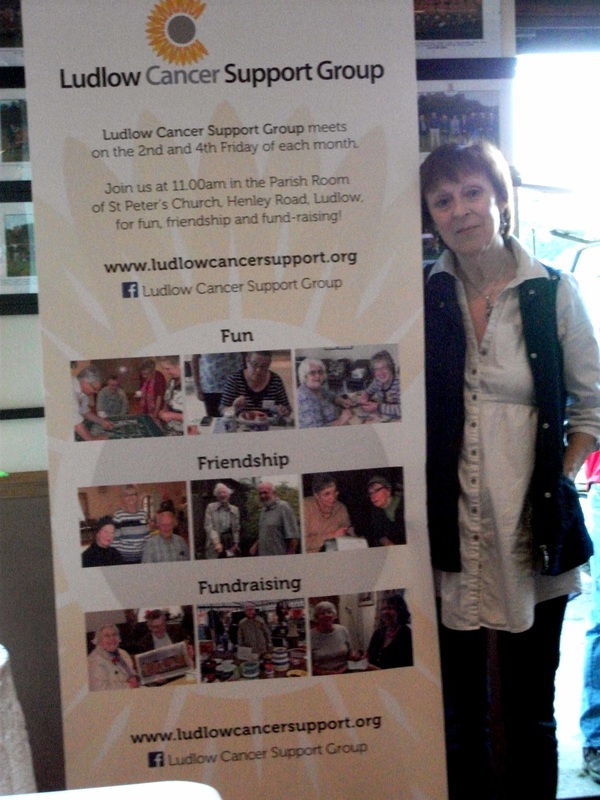 LCSG supporter, Lorna Osborne, with the Group’s newly created stand. First Meeting of our Third Year! The meeting was informal, allowing everyone to chat and catch up on each other’s news. Nikki from Loudwater Studios and her husband, Mike, brought the pots members made earlier this year, which she has now fired. They will come again in the New Year, with the potter’s wheel and more clay! Wigley’s Fields Allotments in Dinham are a wonderful place to just sit, listen to the birds singing, or look at the wooded skyline. And – because of a wonderfully generous offer from the Wigley’s Field Allotments’ Committee - that is just what members of the Ludlow Cancer Support Group can do! The Allotment Committee has allocated a specific area for LCSG members to sit quietly and absorb and enjoy the beauty and healing power of Nature. Within a very short time, nettles were cleared, ground tilled, wild flower seed sown, and vegetables planted. A memorial bench has been donated, a medieval monastery herb garden created, and a scarecrow made. And on Thursday 25 August, ‘Joan’s Garden’ was formally opened, in memory of Joan Farley, who was instrumental in setting up the Group. Dave Bissell’s stall in Ludlow Market on Monday 1st August was a sight to behold! Dave was in situ, in the rain, ready to take money and donations for the Ludlow Cancer Support Group. Thank you Dave, and thank you to Lorna for transporting all the ‘collectables’ and to Joan, Lorna’s Mum, for transporting Dave! We really do appreciate all these endeavours. Reiki is a treatment in which healing energy is channelled from the practitioner to the patient to enhance energy and reduce stress, pain, and fatigue. LCSG supporter, Marilyn Gaunt, is a Second Degree Reiki student who first discovered Reiki in 2008. Marilyn shared her knowledge with members in April, and attends meetings as often as possible to offer a ‘hands-on’ experience. Sessions last for 45 minutes, enabling members to thoroughly relax and relieve some of their day-to-day stresses. BBC Radio 4’s ‘Desert Island Discs’ was first broadcast on the BBC Forces Programme on 29th January 1942. 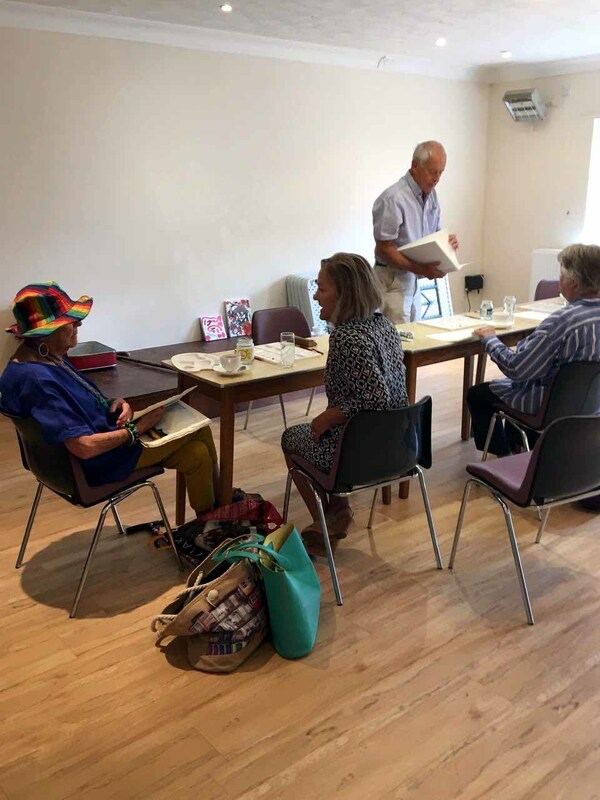 And 74 years later, members of the Ludlow Cancer Support Group staged their own version of the programme, when Group Treasurer, Howard Goslyn, stepped into creator Roy Plomley’s shoes and presented and played a variety of requests. THE QUEEN WRITES TO JACK! 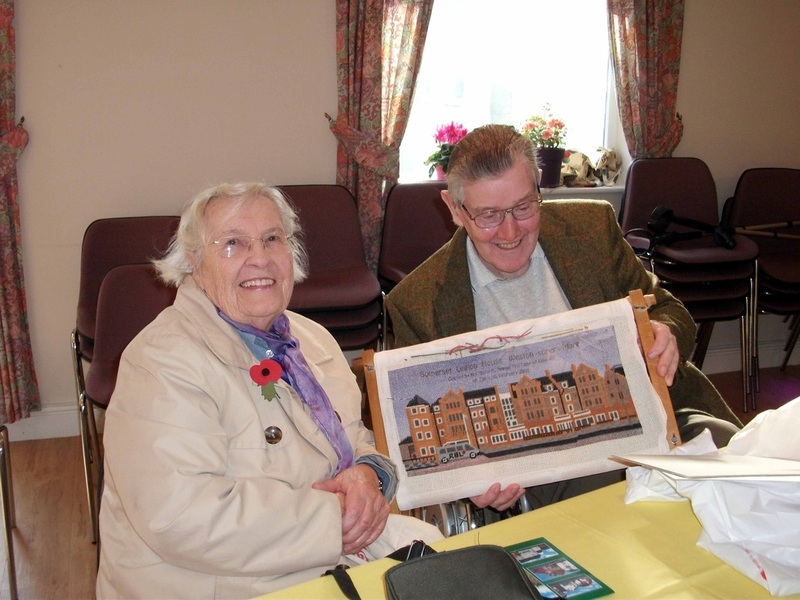 Friday the 13th is unlucky for some, but on 13 May, LCSG member Jack Andow brought in a tapestry he had made, celebrating the Queen’s 90th birthday. Fellow member, Claire Taylor persuaded Jack to send it to Buckingham Palace. He did so, with a covering letter telling Her Majesty that he was confined to a wheelchair. Jack was delighted to receive a letter from the Queen’s Lady-in-Waiting, thanking him for his wonderful his gift, and congratulating him upon his many fund-raising efforts. The correspondence also contained a lovely card with a ‘birthday’ photograph of Queen Elizabeth. 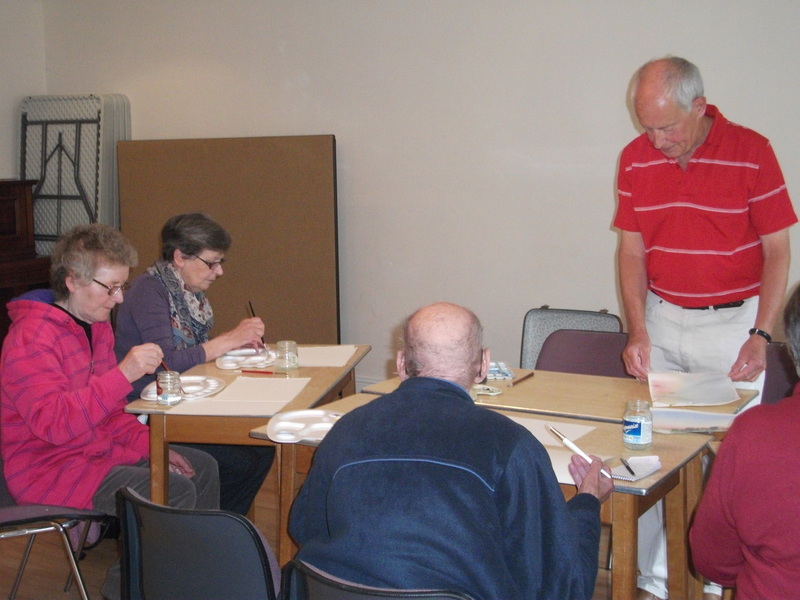 On Friday 22 April, Nikki and Alma, from Loudwater Studio, brought clay and moulds for members of the Ludlow Cancer Support Group to create their own pots. These were taken to the Loudwater kiln to be fired, and Nikki and Alma will bring them to a future meeting for members to paint. Loudwater Studio is a fantastic arts, crafts and sound recording studio available for the whole community to use. Situated on the Burway Trading Estate in Ludlow, the Studio is bright, packed full of artistic materials and has a fantastic atmosphere. Our thanks to Nikki and Alma for a wonderful morning! 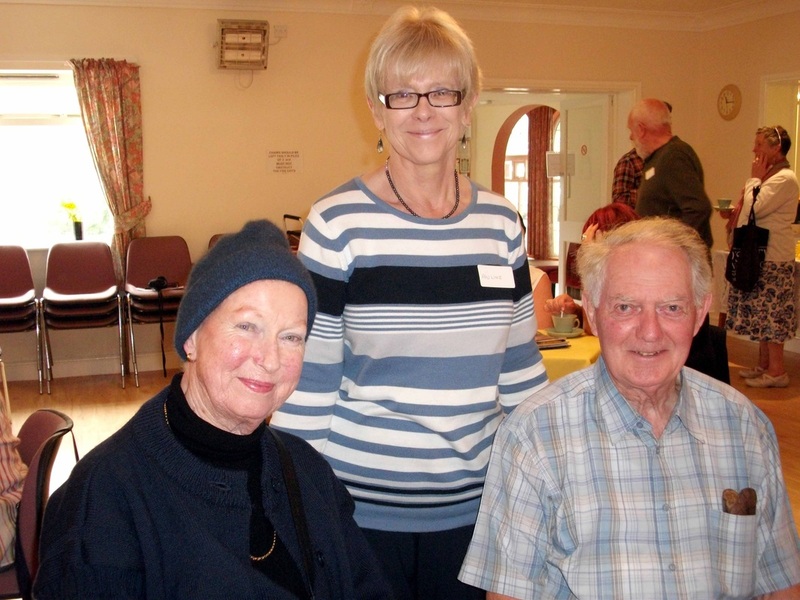 Ludlow Cancer Support Group were delighted to welcome Marilyn Gaunt, who talked about the benefits of Reiki. Regarded as an alternative medicine, Reiki is a treatment in which healing energy is channelled from the practitioner to the patient to enhance energy and reduce stress, pain, and fatigue. It is now an accepted complementary therapy. Marilyn is a Second Degree Reiki student who first discovered Reiki in 2008. 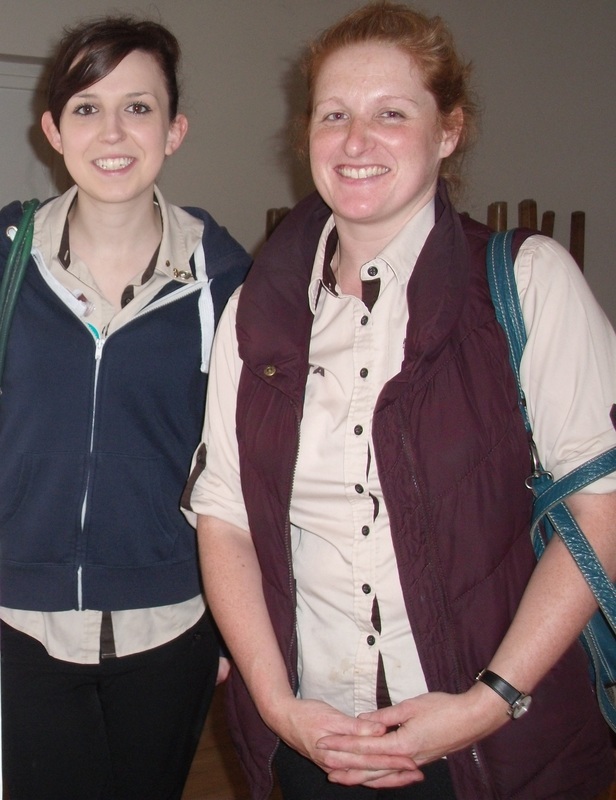 She recently completed a one year Reiki Practitioner course with her Reiki Master, Kate Jones, who practices in Ludlow. 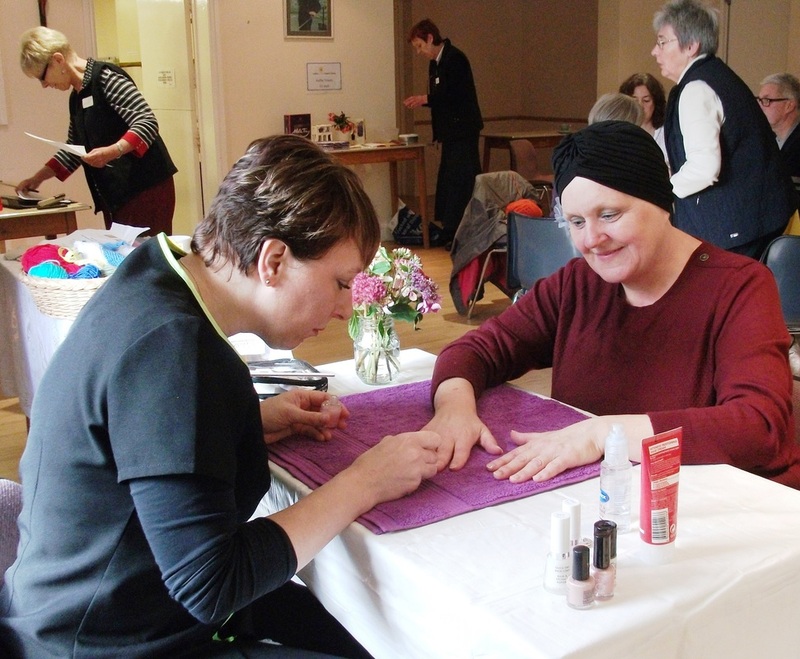 She was keen to share her knowledge and experience, and hopes that the application of Reiki may offer some comfort to those going through the challenges of cancer diagnosis and treatment, and also their friends and families. Marilyn’s talk was accompanied by a demonstration. 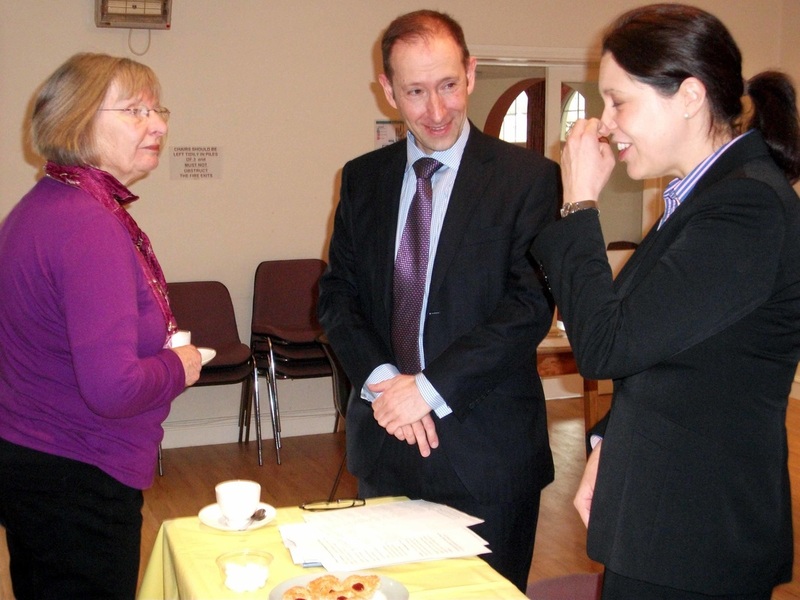 COFFEE MORNING AND BRING AND BUY RAISES OVER £200. 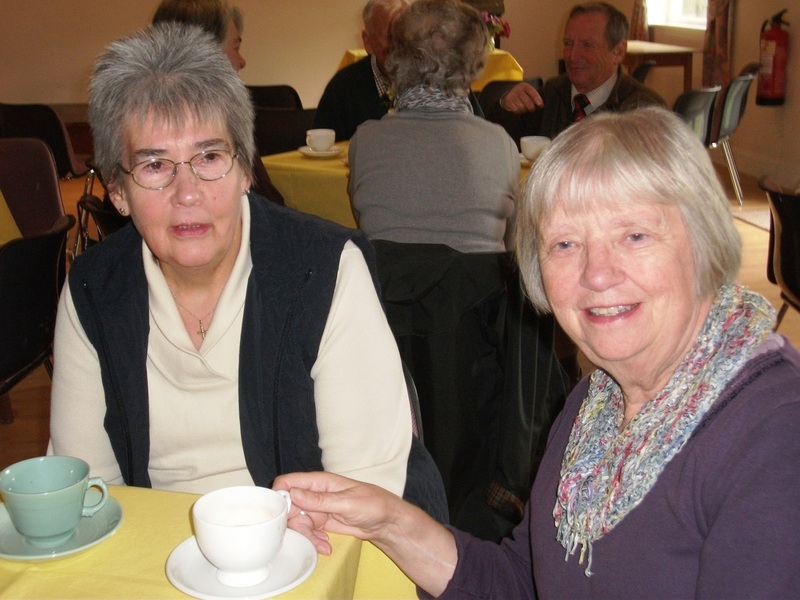 Members and supporters enjoyed coffee, cake and conversation at the Ludlow Cancer Support Group’s Coffee Morning on Friday 26 February. AGM and Final meeting of our ‘First Year’! 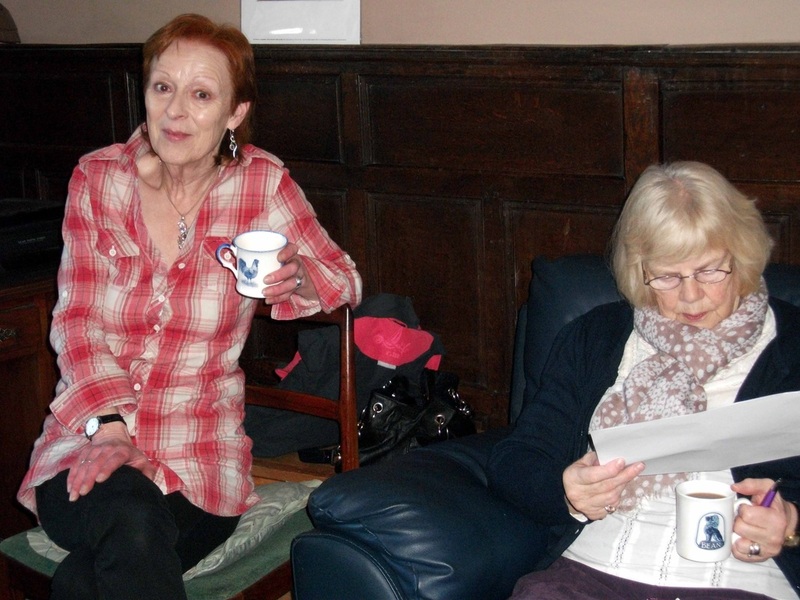 This Friday was the final meeting of the first year of the Ludlow Cancer Support Group! So much has happened. There have been sad moments, much laughter, and many friendships have been forged. The Chairman’s Report (below) sums up our first year, and the Financial Statement is shown under our section on Funding. Incredibly, the Group has met 21 times since our first meeting on 12 September 2014. In that time, we have organised our own coffee morning; a Macmillan Coffee Morning, a fund-raising afternoon tea, and a May Fayre. 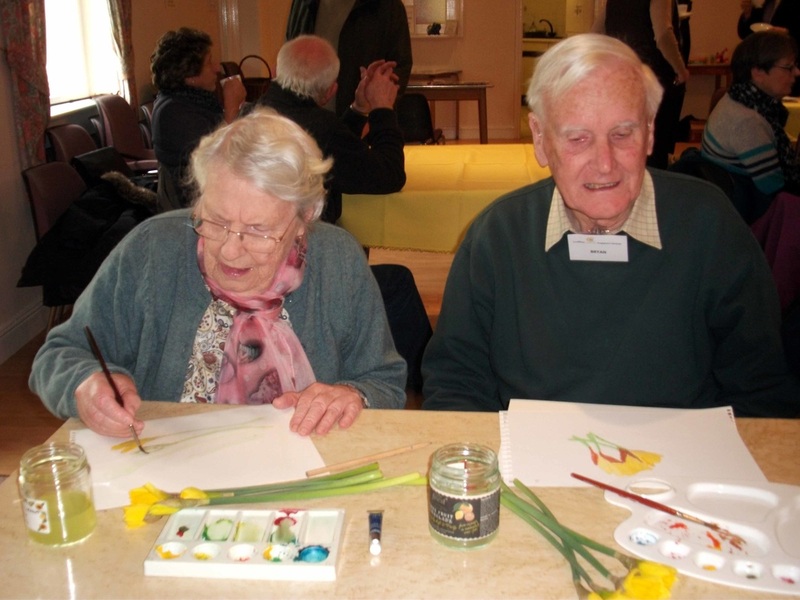 We have enjoyed painting, poetry and prose; music and martial arts; flower arranging and food. We ‘discovered’ Ludford, and welcomed expert speakers from both medical and political disciplines, but, most importantly, we have come to know and care for one another, and it is wonderful to see how relationships are being forged and developed. 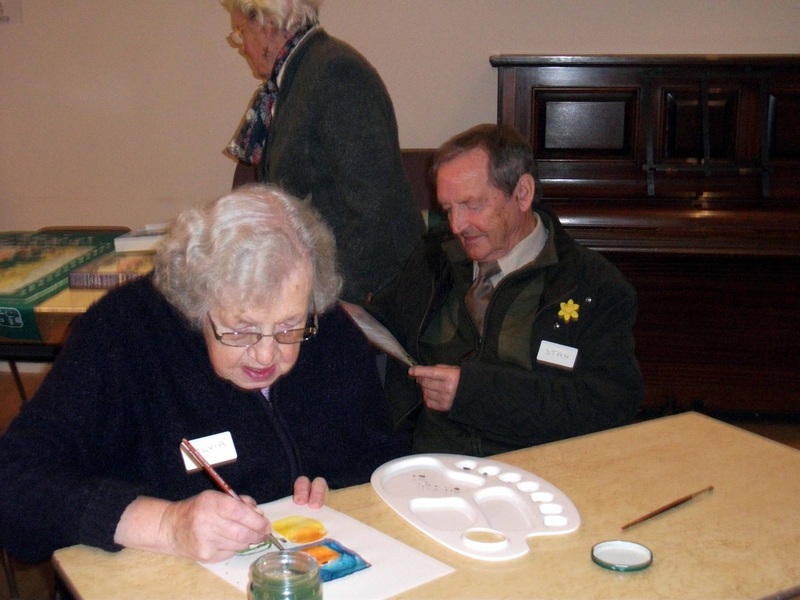 The Group began because member, Joan Farley, was visiting St Michael’s Hospice Day Centre in Hereford. This was very important to Joan, and she repeatedly wished that such a gathering existed in Ludlow. 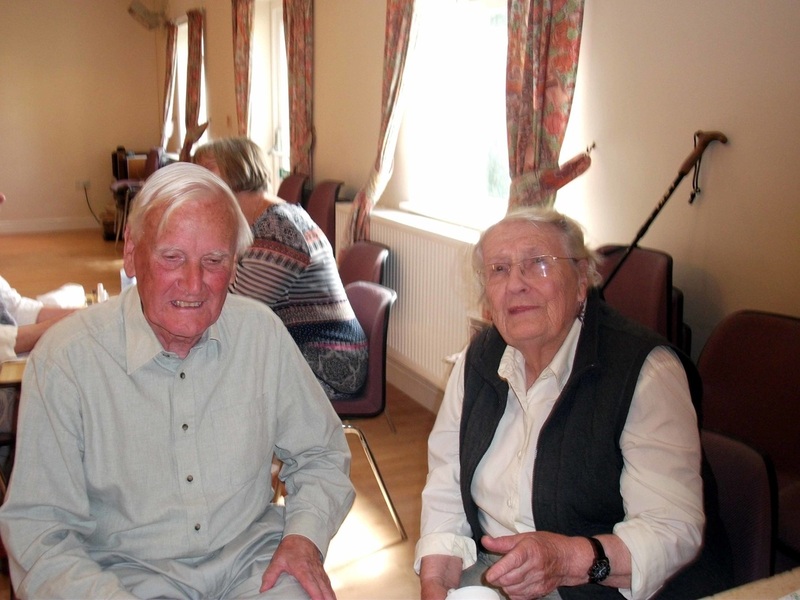 At the same time, John and Dori Ericsson were concerned that the Helena Lane Day Centre was under threat, and asked fellow U3A members to help ‘Save the Centre’. As a result of these two unrelated occurrences, The Ludlow Cancer Support Group was born. And although we have been active for less than a year, 3 different organizations have heard about us and sought our advice ! Appearances matter! You can look great…. 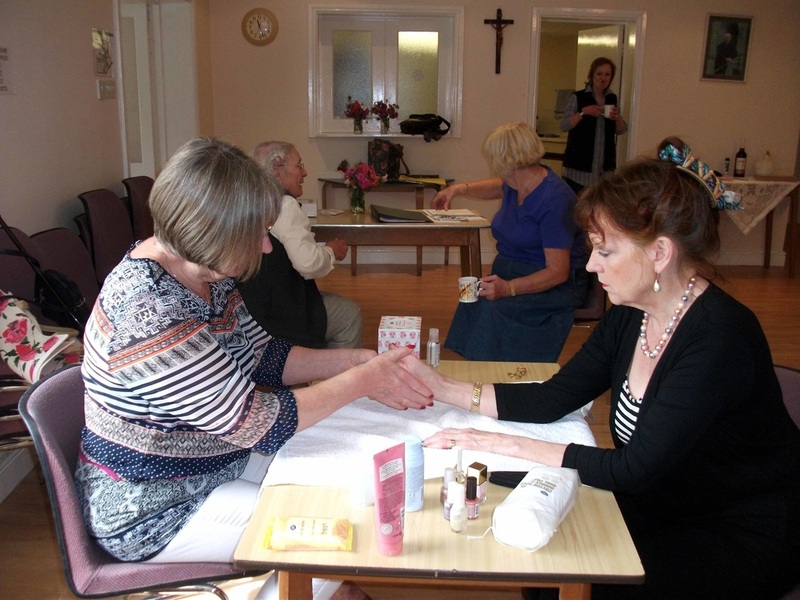 Sadly, Michelle Ebrey, from the UK charity Look Good Feel Better, was unable to join us on 10 July, but committee member Rose Jacks stepped into the breach and ‘pampered’ members by providing luxury hand massages. 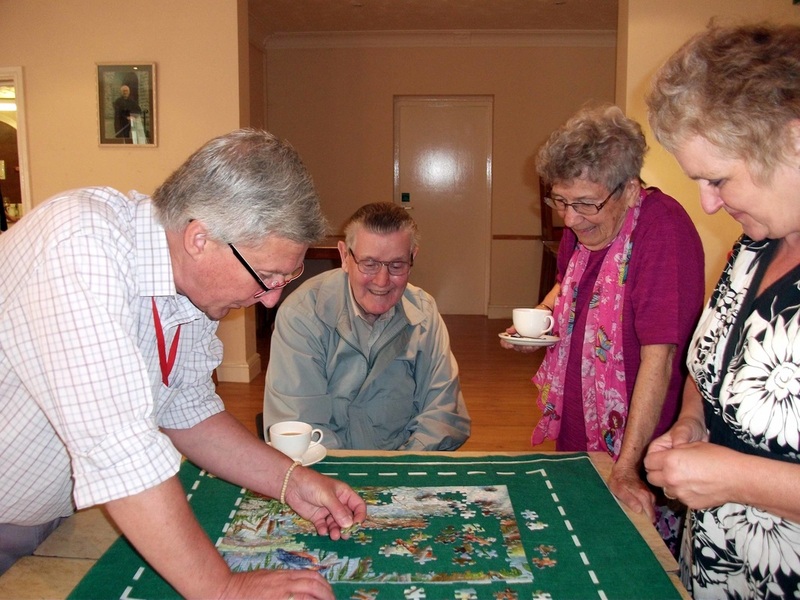 Rob Downes, Jack Andow, Joan Rawlings and Carol Steele prefer to finish the jigsaw. Then they enjoyed the hand massage! 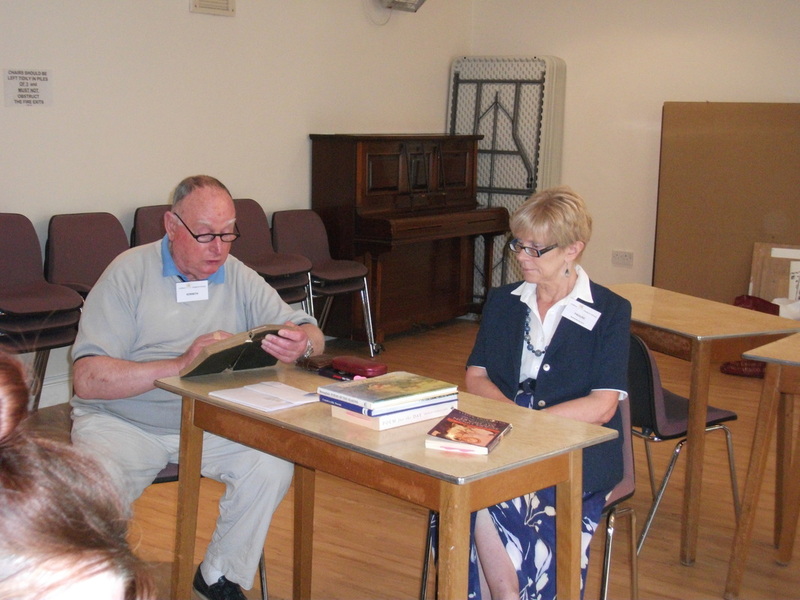 Kenneth Westwood and Pauline Goslyn read a selection of poetry and prose, and this was followed by a ‘Midsummer Madness Buffet’, when 13 members and supporters enjoyed a fabulous feast. 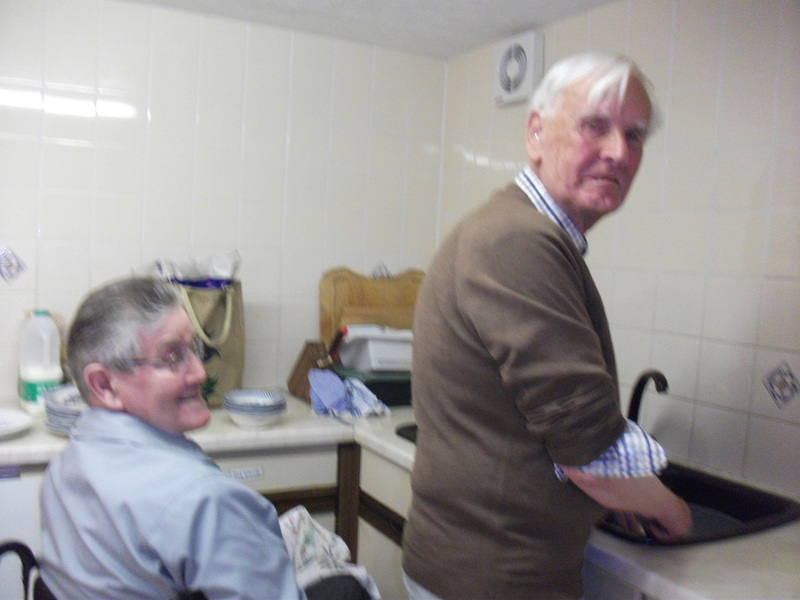 The washing up and drying was undertaken by Jack Andow and Bryan Heatley! Ken Westwood and Pauline Goslyn entertain! “Leave it to us” Jack Andow and Bryan Heatley wash up! 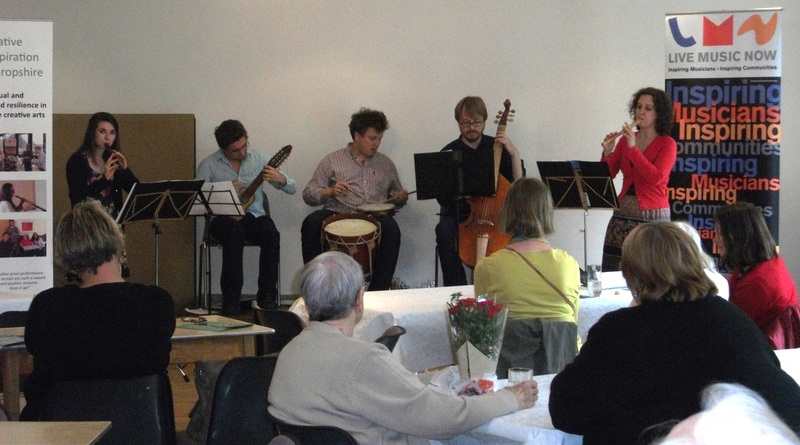 On Friday 12 June, around 40 members and guests of the Ludlow Cancer Support Group enjoyed the most marvellous programme of music, created by musicians from the K’antu Ensemble. 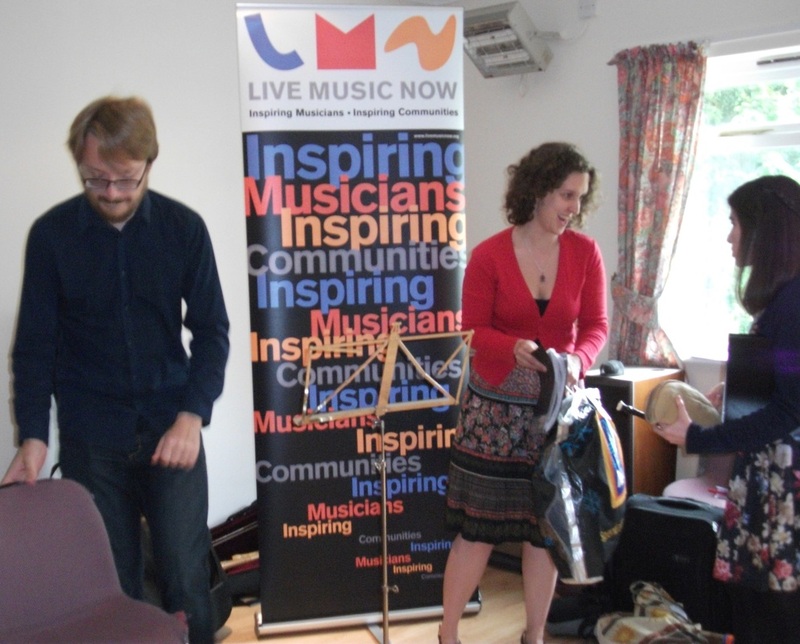 The event was organised by the Ludlow Cancer Support Group in partnership with Creative Inspiration; together they booked the K’antu Ensemble through ‘Live Music Now’, a charity founded by Yehudi Menuhin, which encourages young, professional musicians to interact with the audience, creating a positive impact on individual and collective wellbeing. 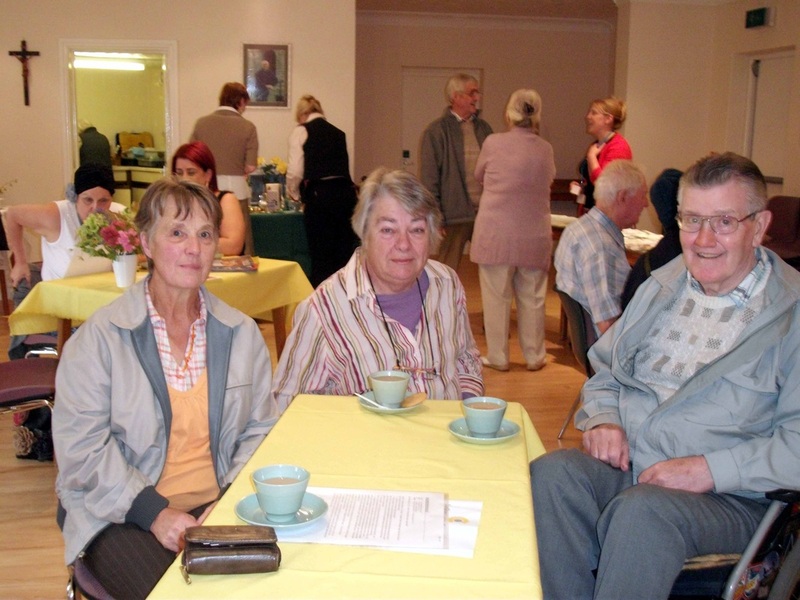 Our thanks to the King Street branch of Costa Coffee and the Rotary Club of Ludlow, for their financial support. 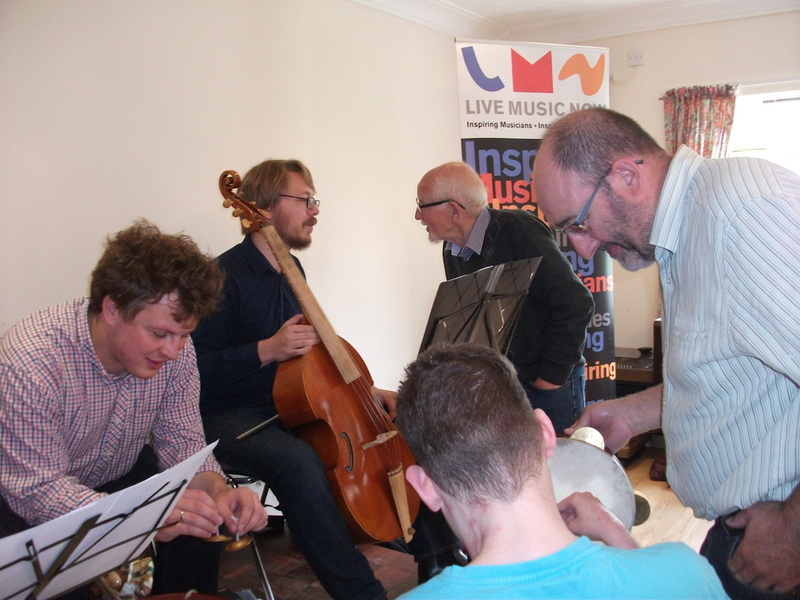 Friday 12 June, 11.15 – 12.45, The Parish Room, St Peter’s Church, Henley Road, Ludlow Anyone suffering from an incurable or disabling illness can feel vulnerable or isolated and often something as simple as music can be an amazing support. The Ludlow Cancer Support Group, in partnership with Dr Jane Povey from Creative Inspiration, is staging an interactive morning of music, “Music for Health, Harmony and Wellbeing”. Jane, a GP in Shropshire, is currently Deputy Medical Director for the UK Faculty of Medical Leadership and Management. She believes creative art and music can improve health and wellbeing, and has established Creative Inspiration, a social enterprise, to implement this. Together, the LCSG and Creative Inspiration have invited the K’antu Ensemble, a group of professional musicians based near Birmingham, to come to Ludlow to perform for members and their guests on the morning of Friday 12 June. The K’antu Ensemble has been booked through ‘Live Music Now’, a charity founded by Yehudi Menuhin, which encourages young, professional musicians to interact with the audience, creating a positive impact on individual and collective wellbeing. 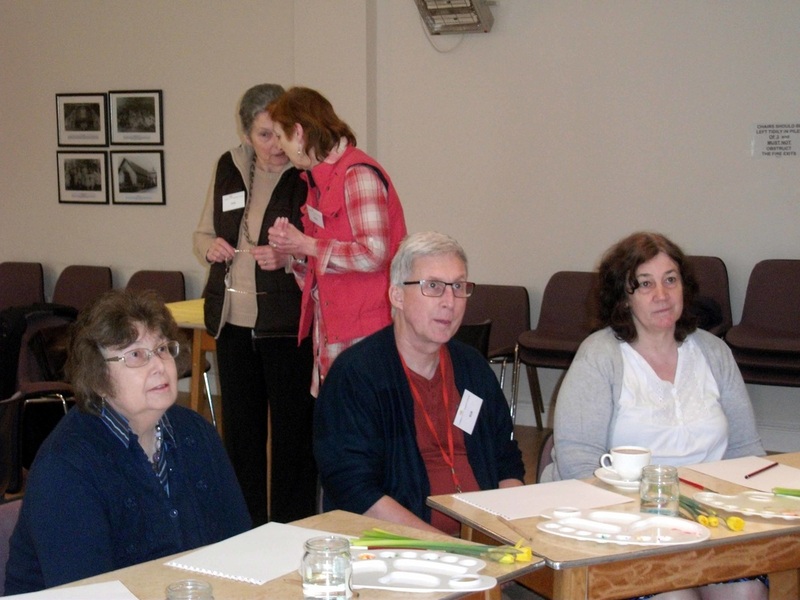 Some members attending the meeting on Friday 22 May enjoyed coffee and conversation, whilst others concentrated on improving their artistic skills! Thanks and congratulations to everyone involved in our fund-raising May Fayre on 16 May. 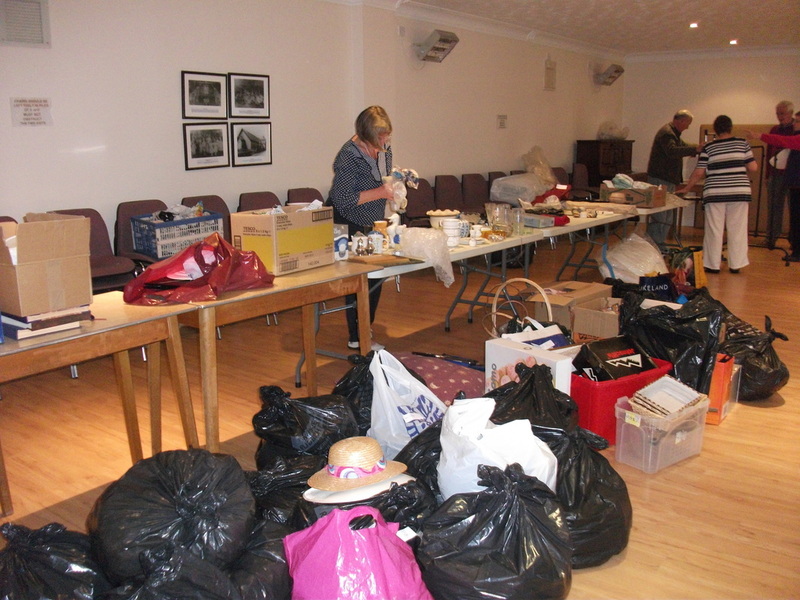 After deducting rental for the hall on Friday and Saturday, we raised the grand total of £670! 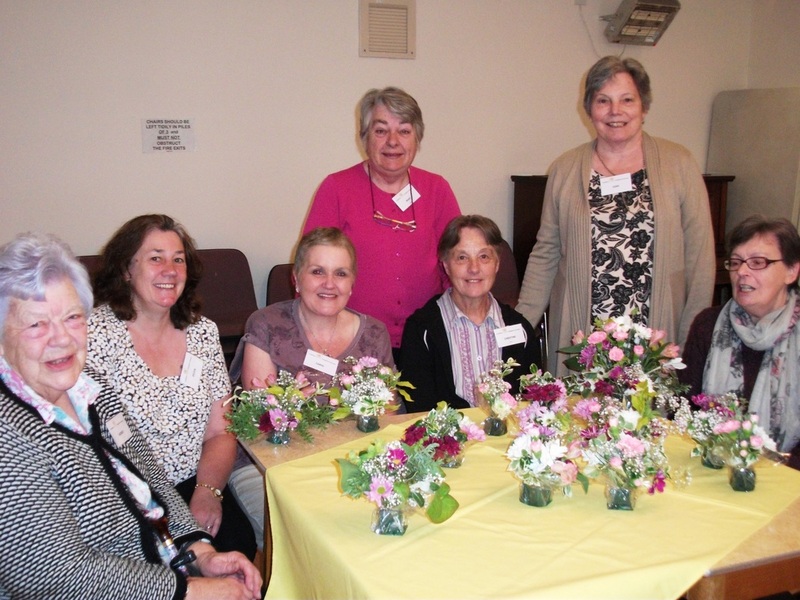 Support Group member, Mary Kirkby, brought a selection of beautiful flowers and skilfully showed us how to produce stunning arrangements. Over half a million people in the UK are now living with breast cancer and this figure is expected to double by 2030. 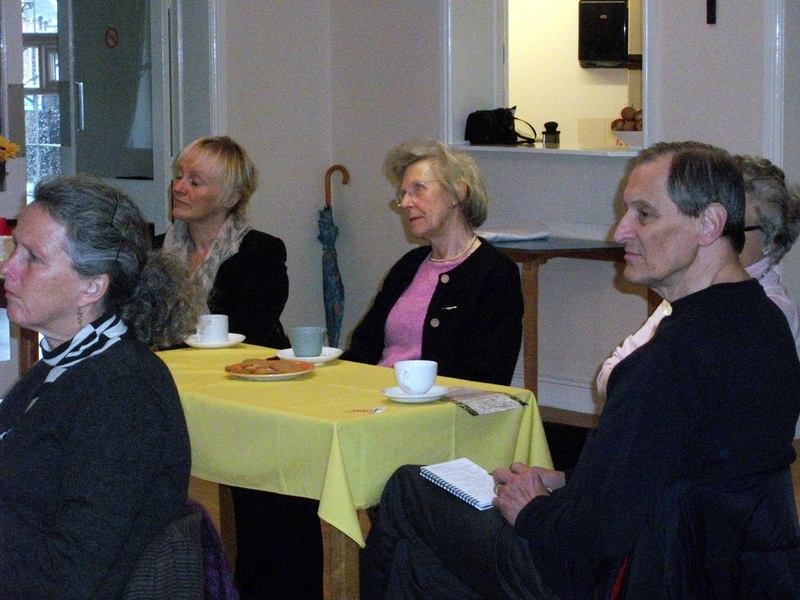 Members of the Support Group listened with interest to a talk by Helen Crilley from The Haven in Herefordshire, about this cancer and the complementary therapies which are available. WE’RE PROUD OF YOU JACK! 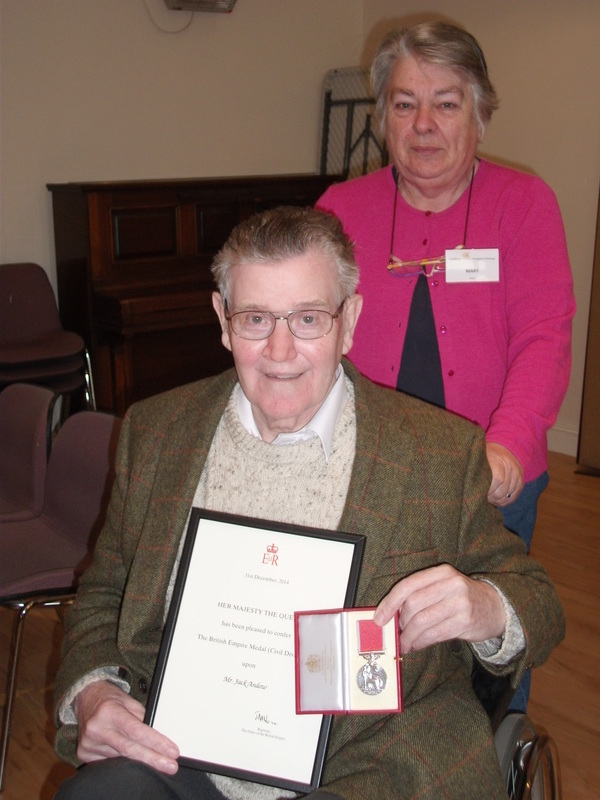 And congratulations to LCSG member, Jack Andow, who was recently awarded the British Empire Medal, for services to charity. LCSG Member, Mary Kirkby, shares the Group’s pride in Jack! 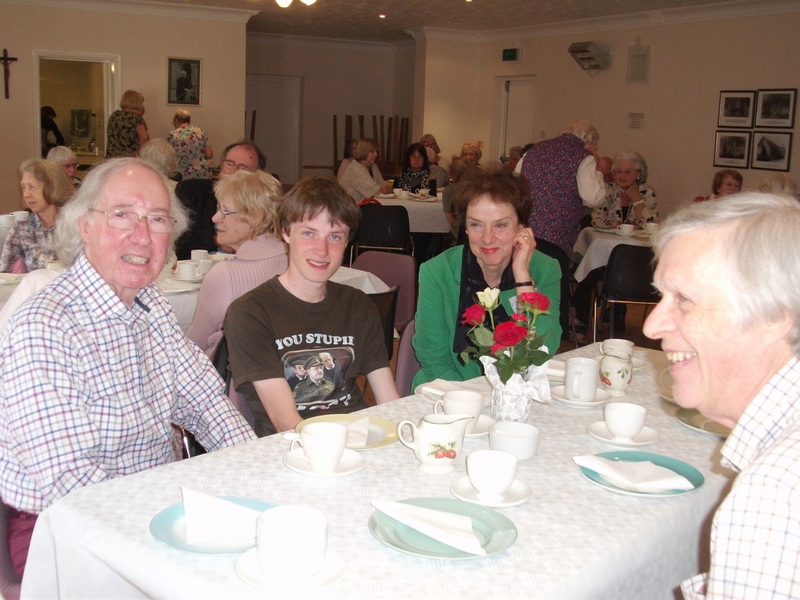 The highly successful Afternoon Tea with ‘Our Albert’ on Thursday 23 April raised £400 for the Ludlow Cancer Support Group. 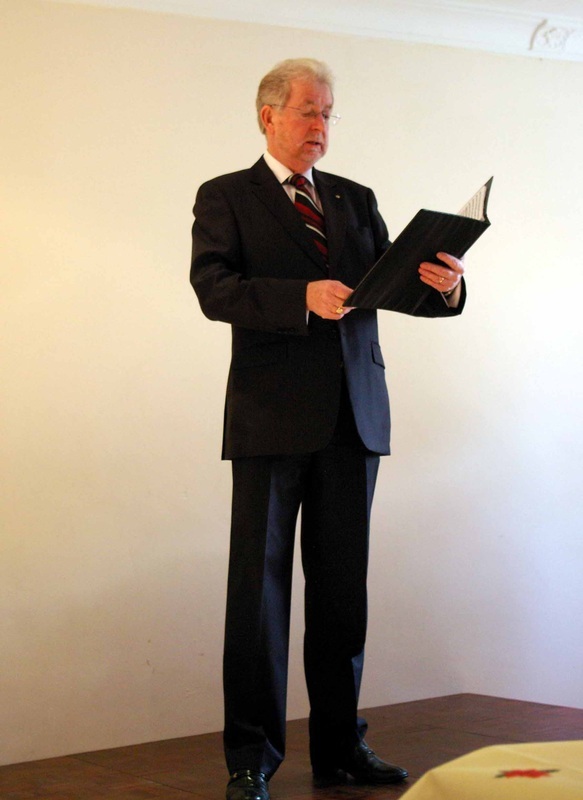 Many thanks to narrator, Stephen Dalton, who made the event possible! His renditions of the Stanley Holloway Monologues describing the adventures of young Albert were superb! 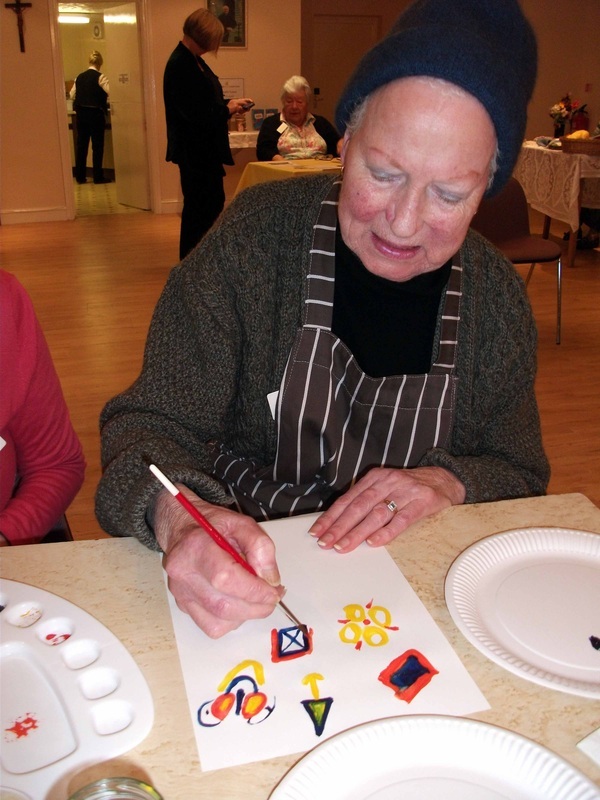 Painting and Powers of Attorney both highly successful! 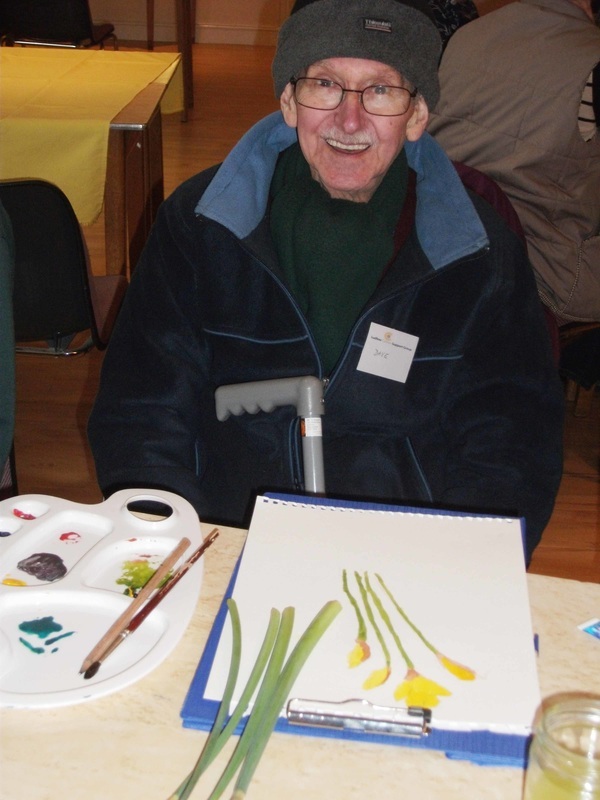 At our last meeting, as a tribute to the season, artist and tutor Bob Wallis invited members to paint daffodils. The response was fantastic as were all the paintings. But one definitely stood out! Ludlow resident, David Bissell, delighted us with his rendering of these beautiful flowers. This was Dave’s first visit to the Support Group, and we hope to see him again. 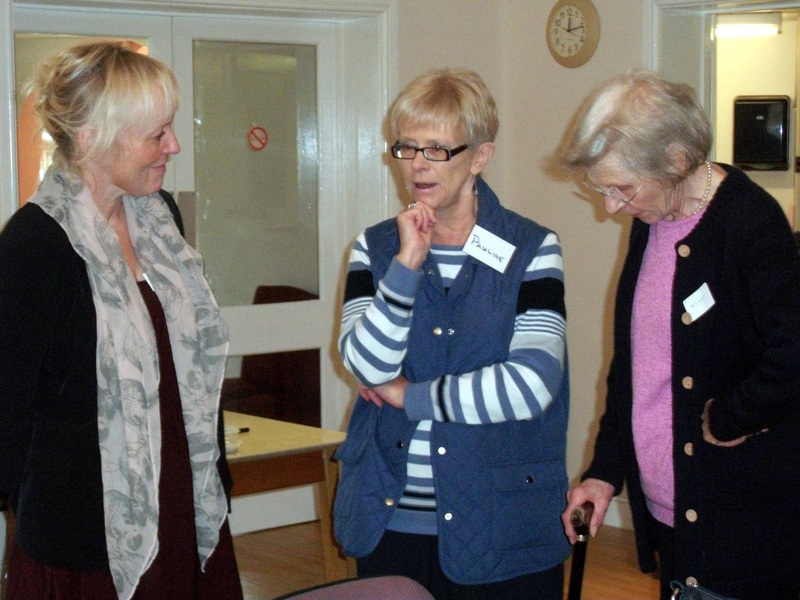 Clinical Nurse Specialist, Gaynor Davies, responded to wide-ranging questions from Group Members. 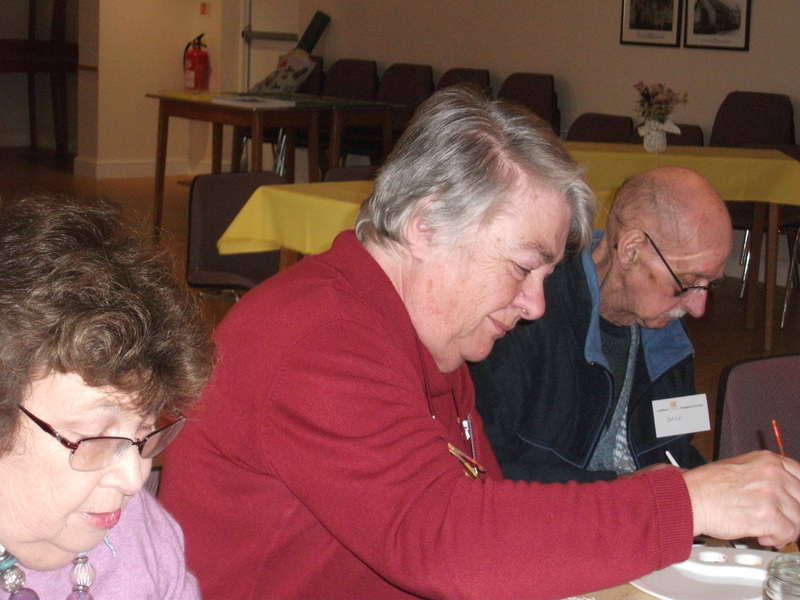 Membership Secretary Pauline Goslyn was ably assisted by member Kenneth Westwood (right) when a variety of poems on the subject of Love and Valentines were read out. And a treat was in store, when member Christine Morris (seated right, with Christine Wait, left) baked some heart-shaped biscuits to accompany our morning coffee! Three separate events took place at this meeting, each an achievement in itself. 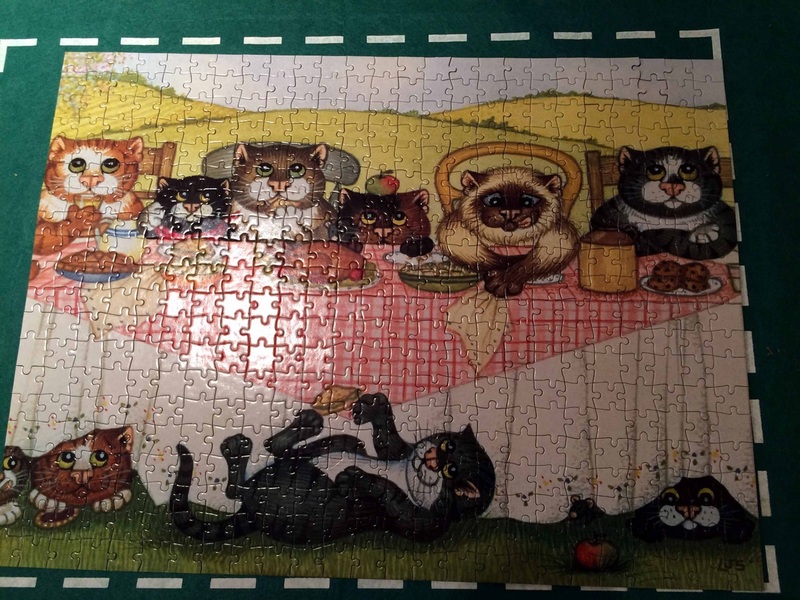 Firstly, after several weeks of effort, the highly sophisticated and intellectual jigsaw was completed. 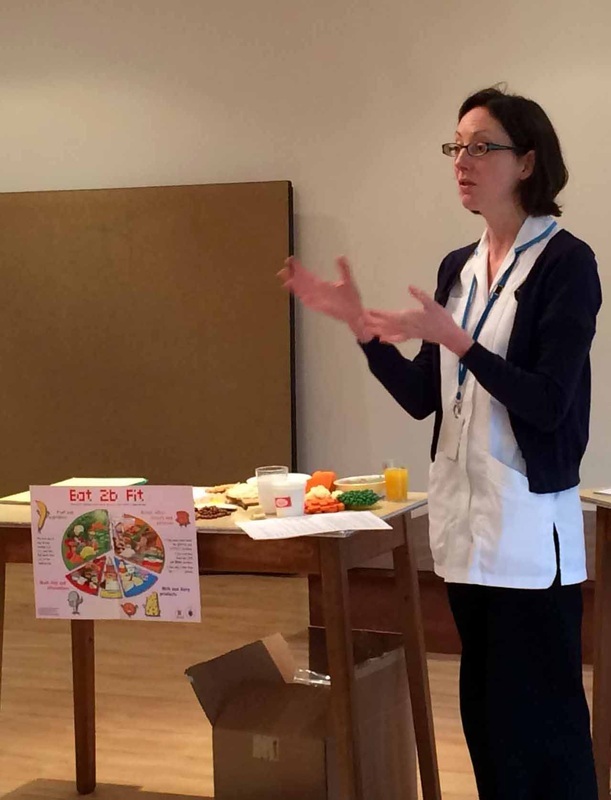 Secondly, we welcomed Catherine Voyce, a Macmillan Dietician at the Royal Shrewsbury Hospital, who talked to members about Healthy Eating. 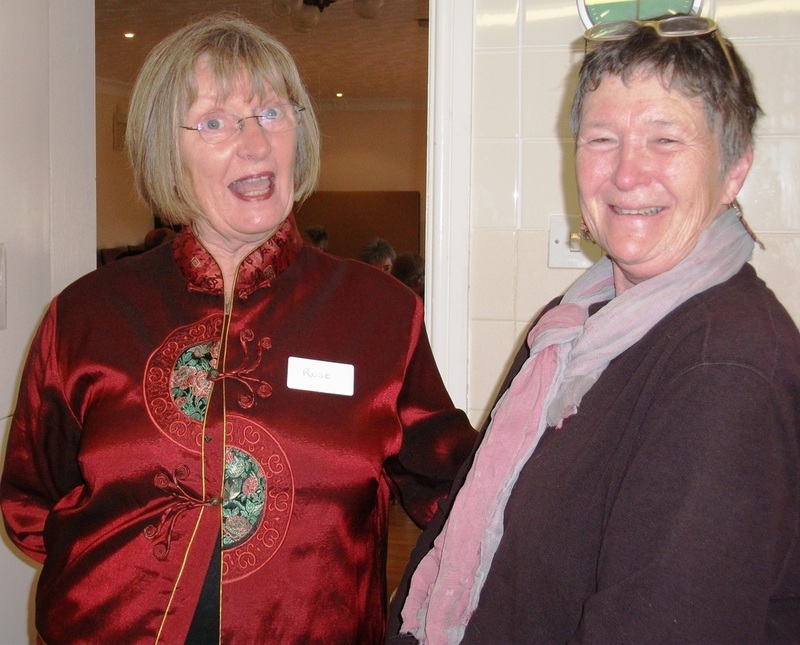 Members began the New Year by indulging in both Poetry and Tai Chi! 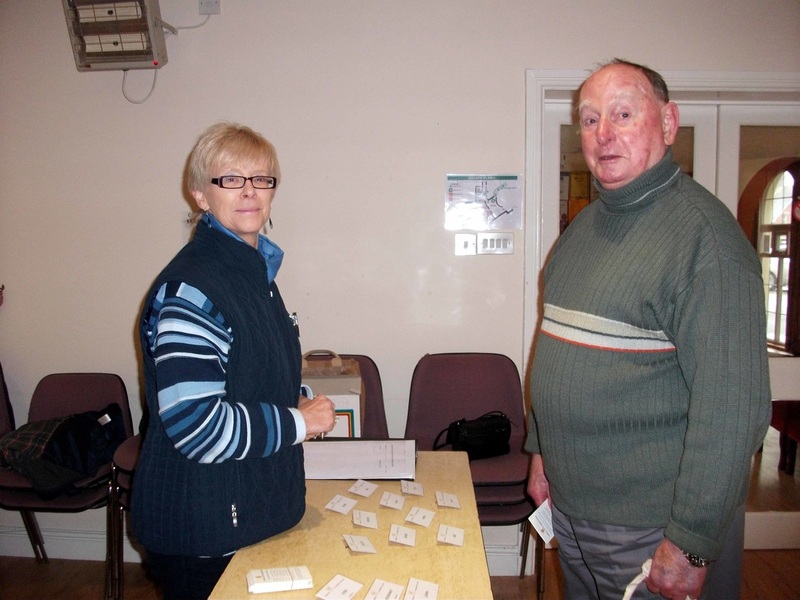 “I was delighted at the response!, said Membership Secretary, Pauline Goslyn, who led the session. “Everyone brought a poem to read aloud and discuss, and some brought several books...” We’ll be doing this again, by popular request! By focusing the mind on a variety of movements, Tai Chi helps to bring about a state of mental calm and clarity. The small group of men and women who worked with instructor, Rose Jacks, learnt that this ancient discipline can improve general help, reduce stress levels, teach us about meditation and improve our wellbeing. We look forward to learning more over the coming months! 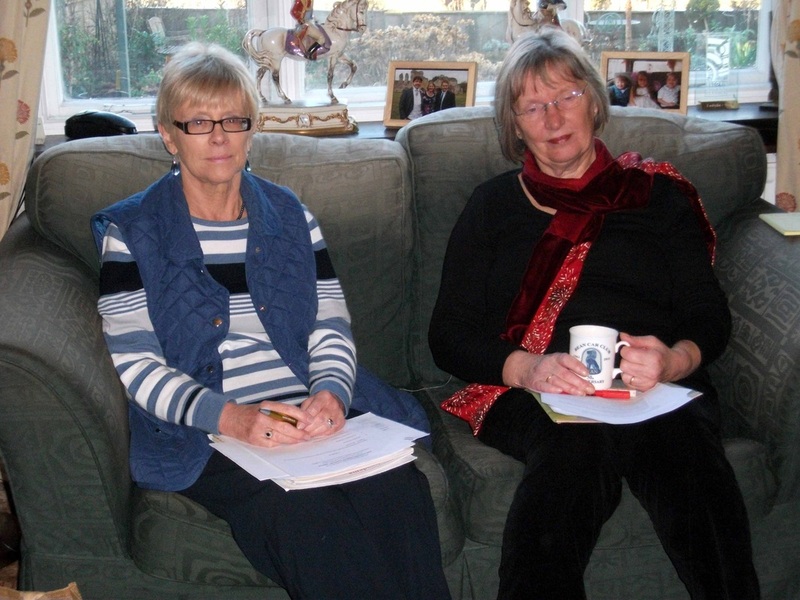 The committee met at the home of Chairman, Rosemary Wood, to approve the Events Calendar for 2015. See our exciting programme under ‘Diary Dates’ on the website. Pauline Goslyn and Rose Jacks; Joan Farley and Kim Holroyd; Dori and John Ericsson and Elizabeth Owen; Lorna Osborne and Rita Rogers. The Group’s final meeting of 2014 literally ended on a high note. 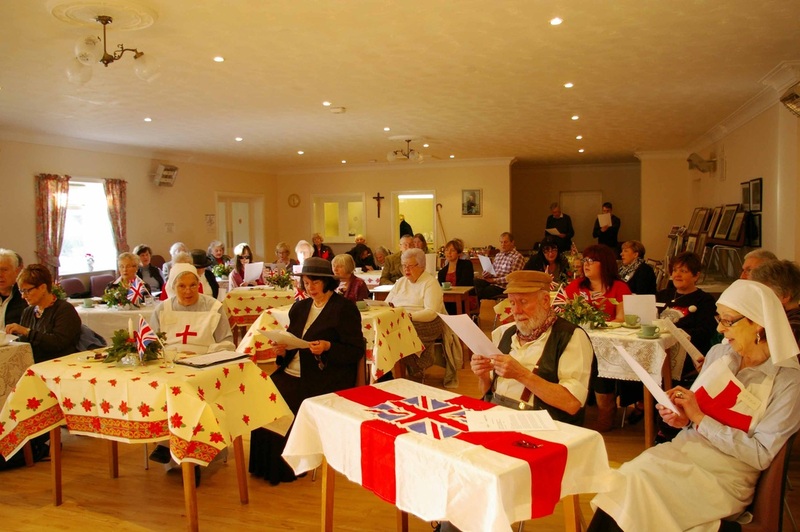 The theme was ‘Keep the Home Fires Burning’, and an audience of members, supporters and guests listened to Michael Evans reading an abbreviated account of the part Ludlovians played both at home and on the Western and other fronts during World War 1. 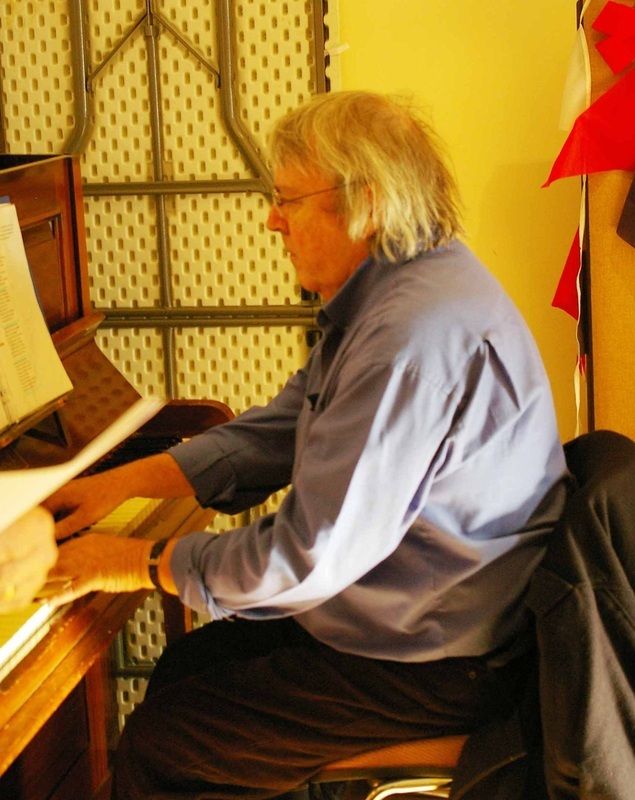 Steve Dunachie provided the accompaniment to a selection of popular war songs, and members of Rockspring Community Choir helped swell the chorus. 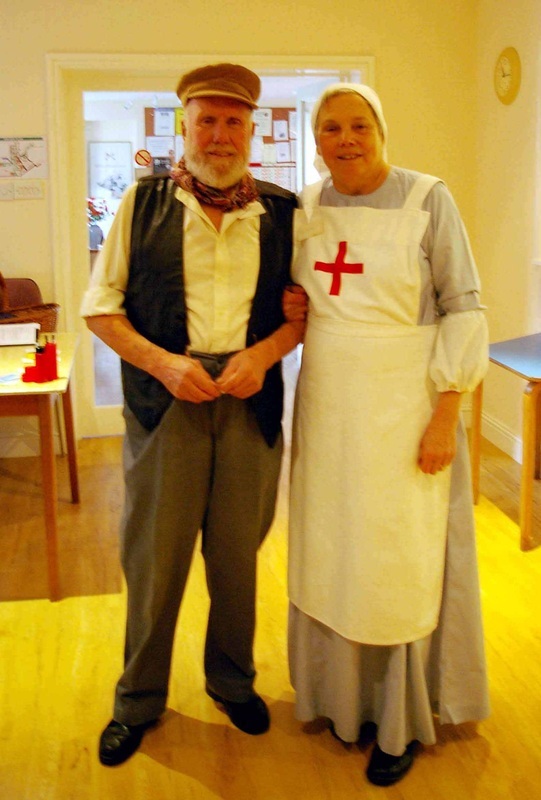 Members of the Support Group’s Committee entered into the spirit of the occasion, by wearing ‘appropriate dress’! 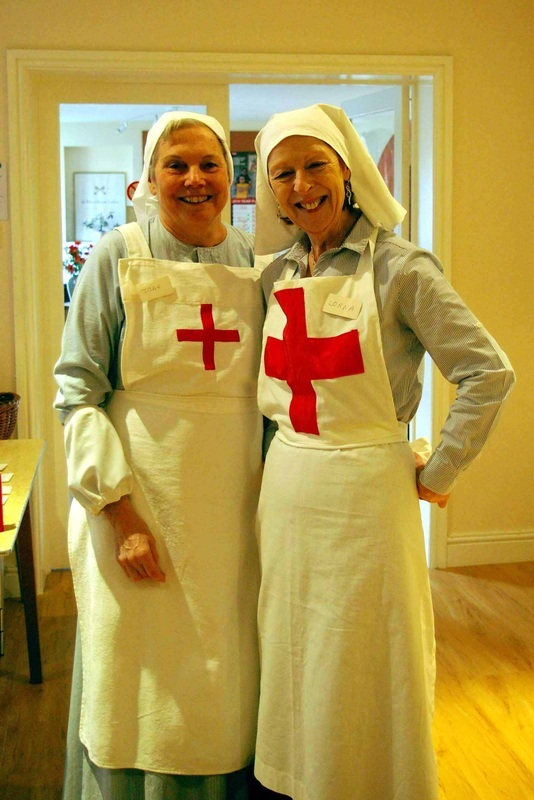 Joan Farley and Lorna Osborne provide medical back-up! 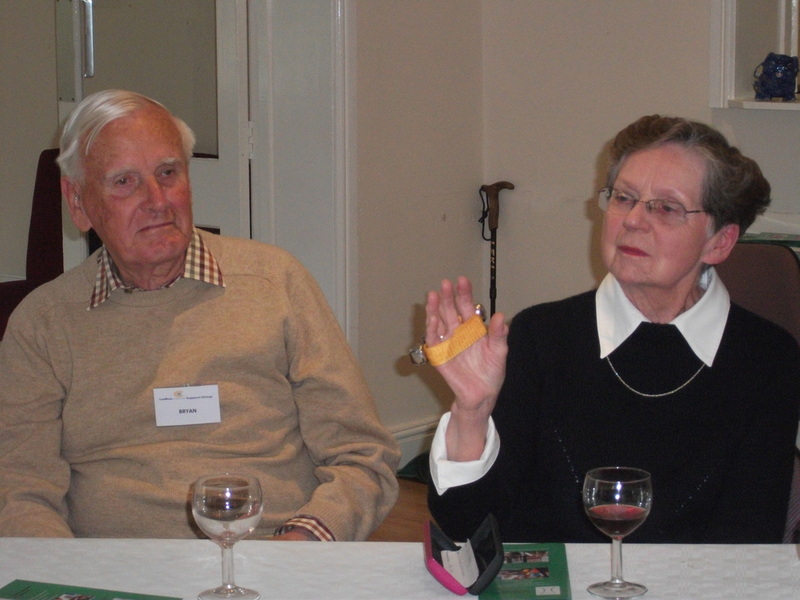 So said member, Doug Charlton, to his wife on arriving home after attending the Group meeting on 14 November. “Today’s speaker, Gaynor, spoke more common sense about the subject of Pain than all the professionals I’ve seen so far....”. 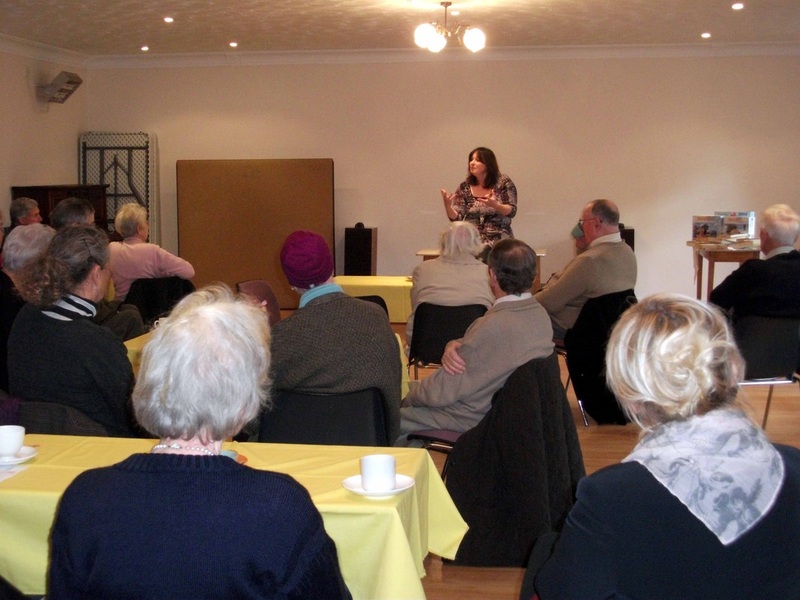 Doug joined 25 members and supporters of the Ludlow Cancer Support Group to hear Clinical Nurse Specialist , Gaynor Davies, speak about “Pain Relief and Symptom Control”. 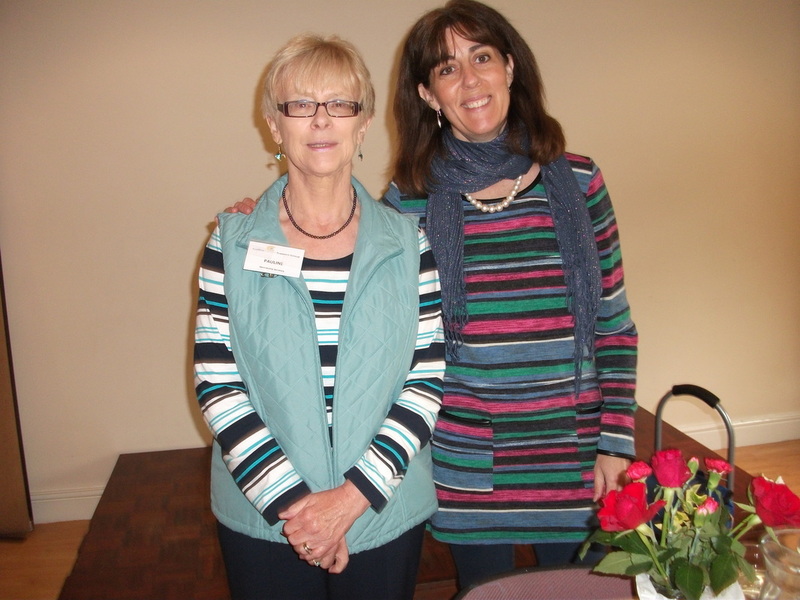 Gaynor’s talk was not only informative: it was humorous – just what the doctor ordered! 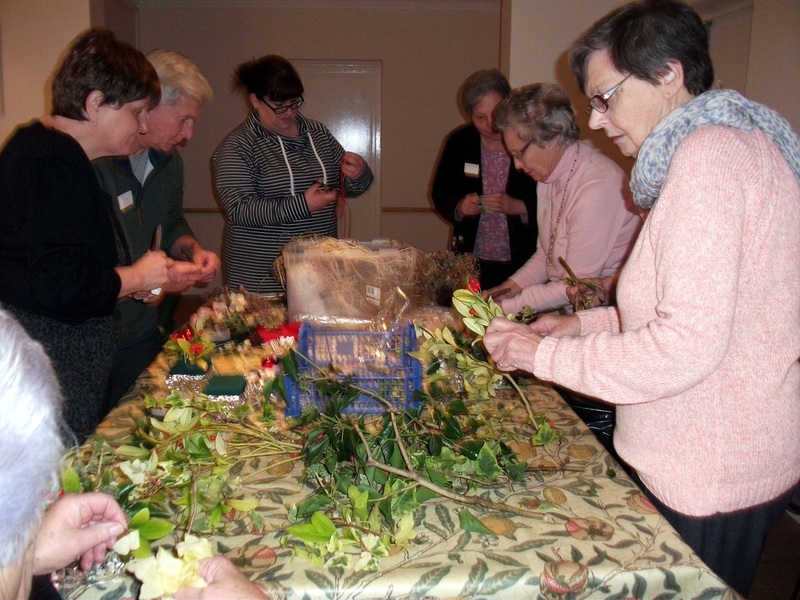 Pain relief discussed and experiences shared members then turned their attention to the lighter subject of making table decorations for Christmas! "I’m busy all year round!" 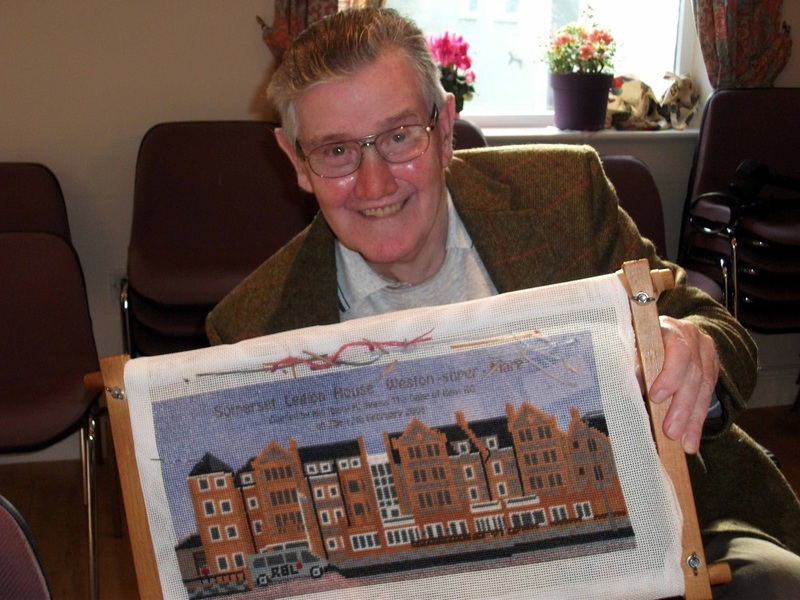 LCSG member, Jack Andow, is well-known locally for his ability to create superb tapestries. Here he demonstrates his skill to the Group’s Secretary, Dori Ericsson. 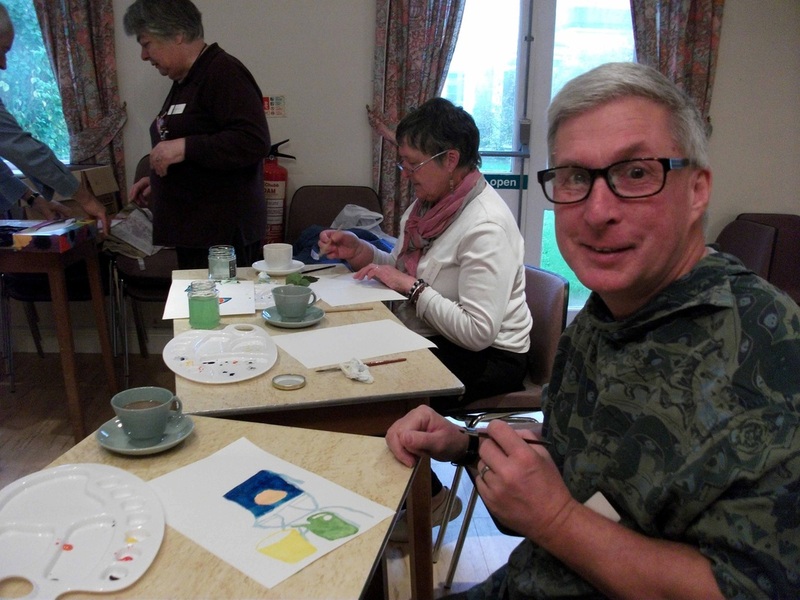 Bob’s painting class is a great success! 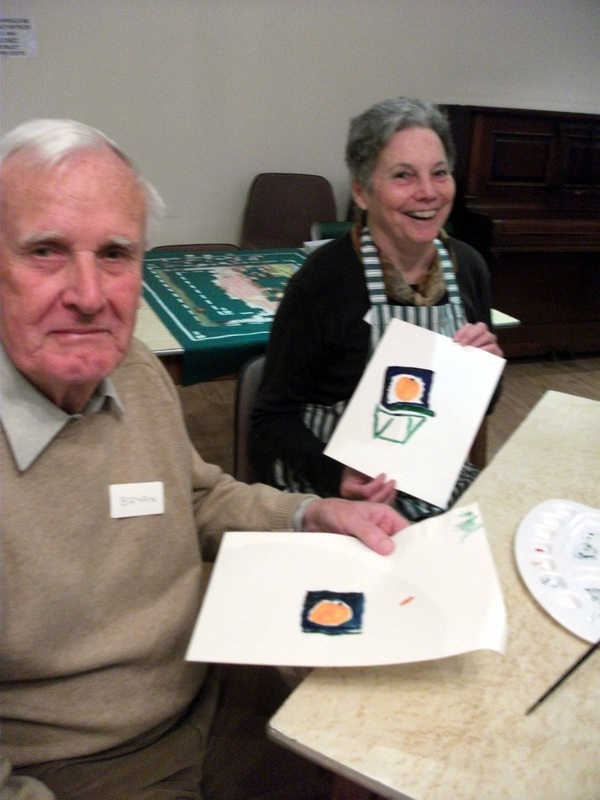 When the great art galleries of the world are clamouring to buy paintings of a Matisse-inspired orange pumpkin, green watering can and yellow bucket, remember, you saw them first at the Ludlow Cancer Support Group on Friday 24 October! KNITTING WOOL NEEDED - PLEASE HELP! 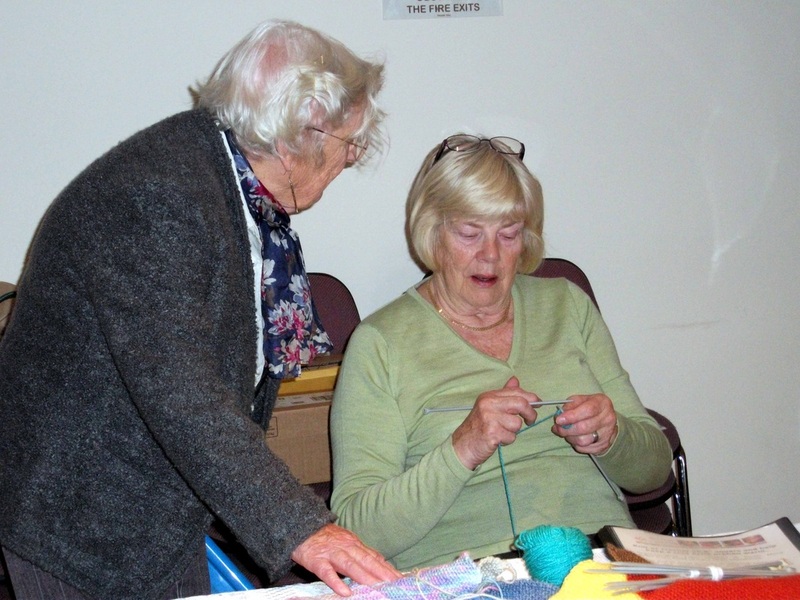 Members of the Ludlow Cancer Support Group will be knitting squares to make into blankets for some of the deprived and vulnerable children who live in South Africa. Many of the children are orphans or have been abandoned. Some live in great poverty; some are responsible for younger siblings; others live alone, without shelter, in hills and dumps around the cities. We shall be knitting or crocheting 8” x 8” squares, which will be sent to the KAS (knit-a-square charity), where they will be sewn into blankets. Other charities provide food and shelter: we can help provide warmth and comfort to these children. Do you have any spare double-knit wool you can let us have? Who says Tai Chi isn’t fun? Three new members joined us at our 10 October meeting, taking the total number of the newly formed Ludlow Cancer Support Group to 23. 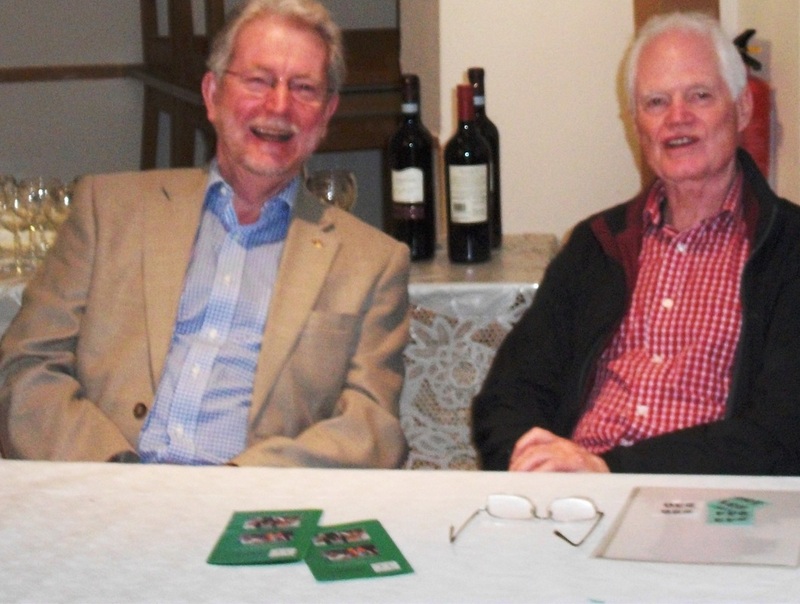 We were delighted to welcome Rob, Stan and Sylvia, and look forward to seeing them again on Friday 24 October. Ooh, lovely.... Manicurist, Sarah Collett, will join us each week to offer members a luxury manicure. 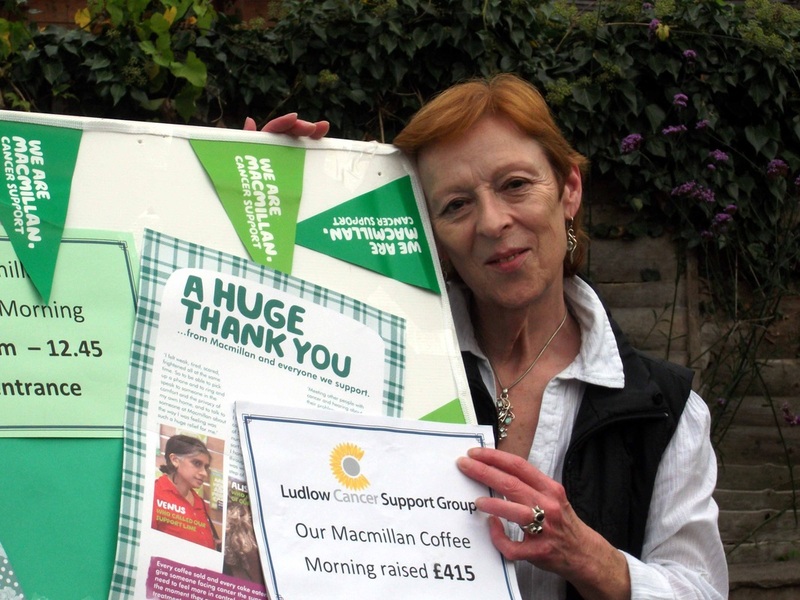 The Macmillan Coffee Morning, organised by the Ludlow Cancer Support Group on Friday 26 September, raised £415.00. Many friends and supporters attended the event, and eight new members also joined! We look forward to getting to know them all over the coming months. A big thank-you to everyone who worked so hard and made the occasion possible! 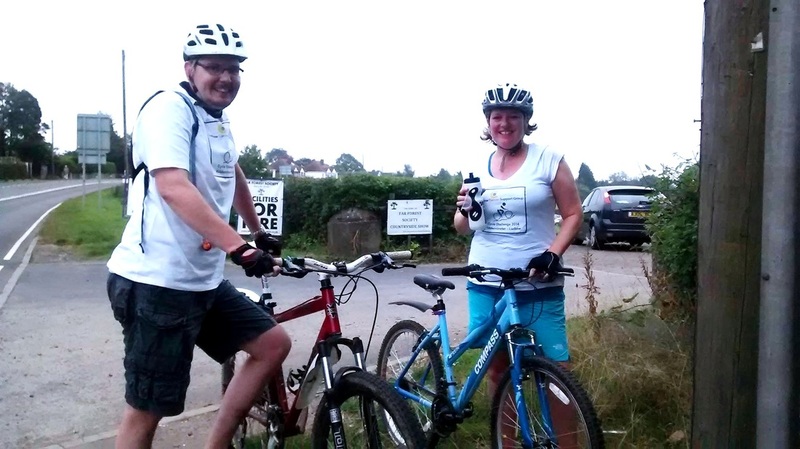 On Saturday 13th September, Tim & Rachael Hebbert, Advanced Nurse Practitioners at Wyre Forest and Dudley respectively, completed their Kidderminster to Ludlow Cycle Challenge in order to raise awareness and funds for the Ludlow Cancer Support Group. 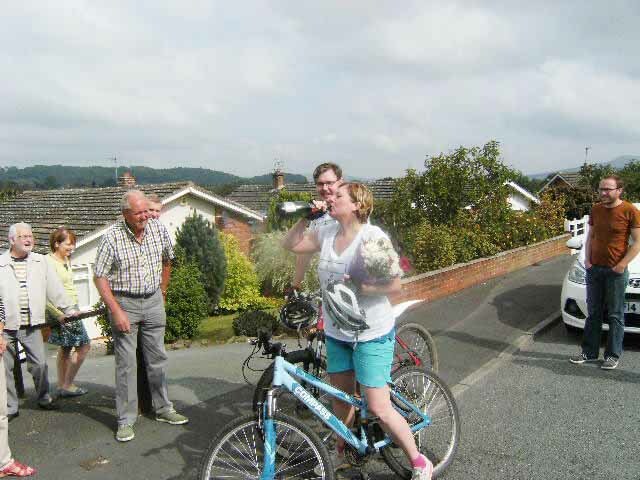 The triumphant couple finished the route of approximately 25 miles, including an ascent of the Clee Hills, in 4 hours 45 minutes. And that included an emergency stop for bacon sandwiches! 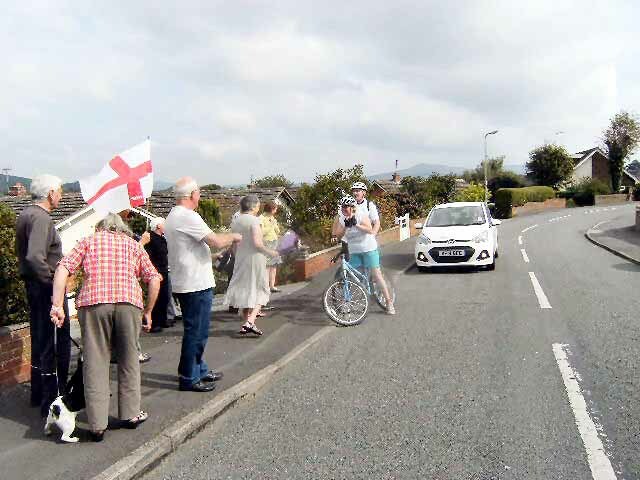 Rachael and Tim’s arrival at Bringewood Road in Ludlow – the home of Rachael’s parents, Joan and Greg Farley - was eagerly awaited by a cheering crowd of family and friends, and £100 was donated there and then! Those bacon sandwiches were good! Christine Wait, Mary Kirkby and Jack Andow! WOW – it was great! 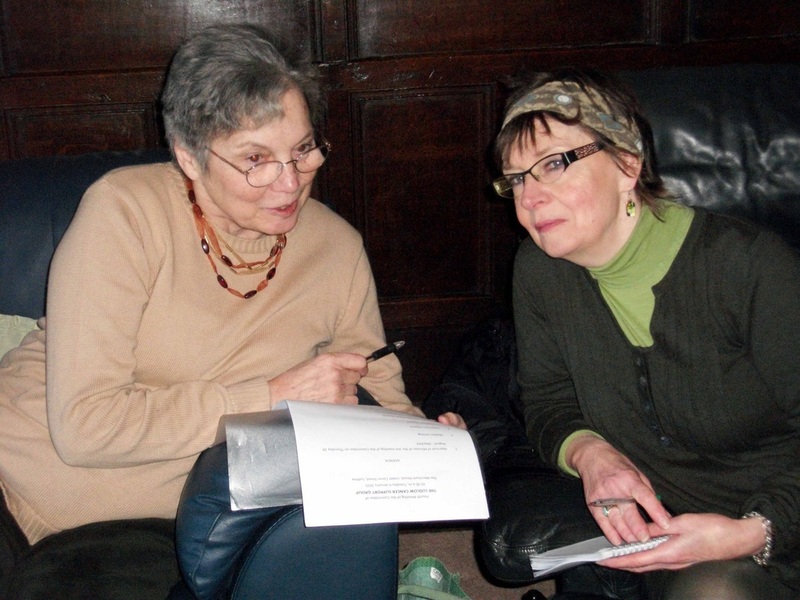 2 ‘professionals’, 5 committee members, 9 supporters and 12 new members came together at the first meeting of the Ludlow Cancer Support Group – and it was great! Conversation flourished, coffee and tea were drunk, cake consumed, and everyone departed looking forward to getting together again at future meetings. We were fortunate to have Gaynor Davies, a Clinical Nurse Specialist, and Gemma McIver, Project Manager for the Patient Self Care Programme at Shropshire NHS, with us. Their professional knowledge and expertise was really appreciated by those present, and they will both be joining us again. 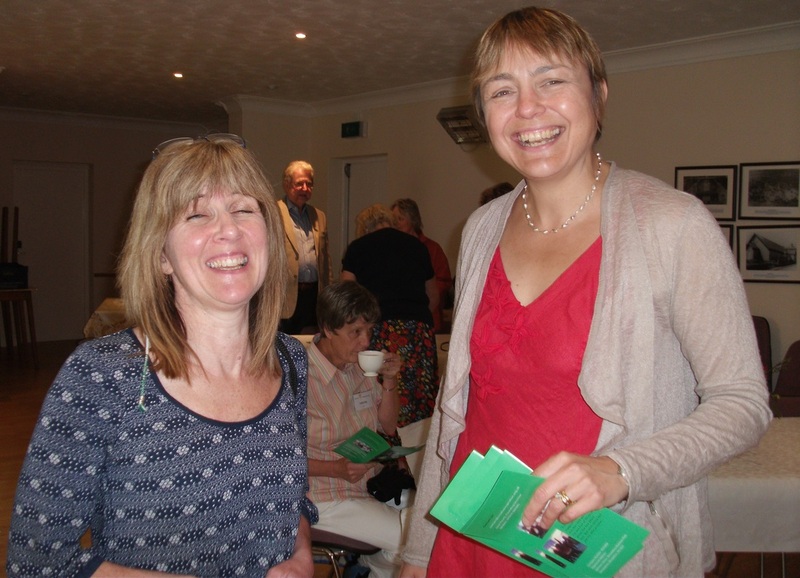 Our second meeting falls on Friday 26 September, which is the date of Macmillan’s World’s Biggest Coffee Morning. So we thought we would combine our event with a Macmillan Coffee Morning, and invite friends, partners and local residents to join us and raise money for an excellent cause. We would be delighted to welcome you on this occasion, especially if you come bearing cake! Car parking is available. 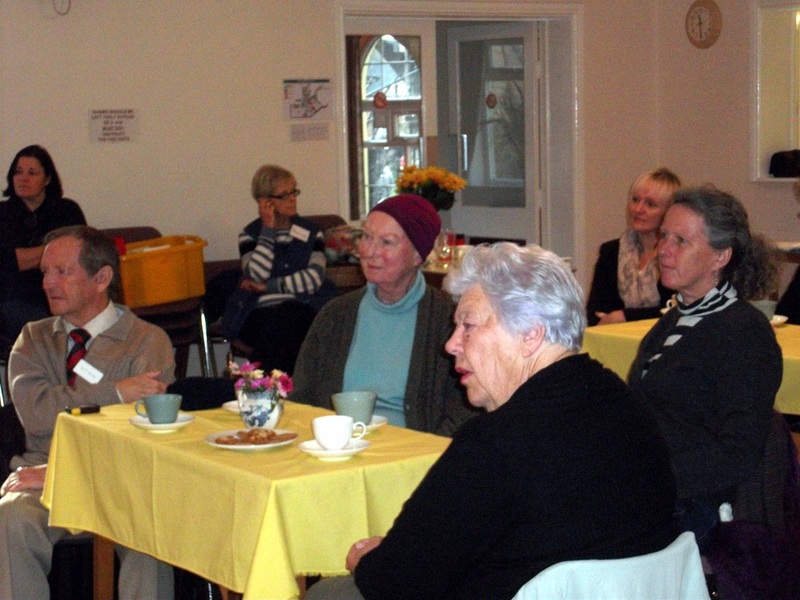 £643 taken at Inaugural Coffee Morning! 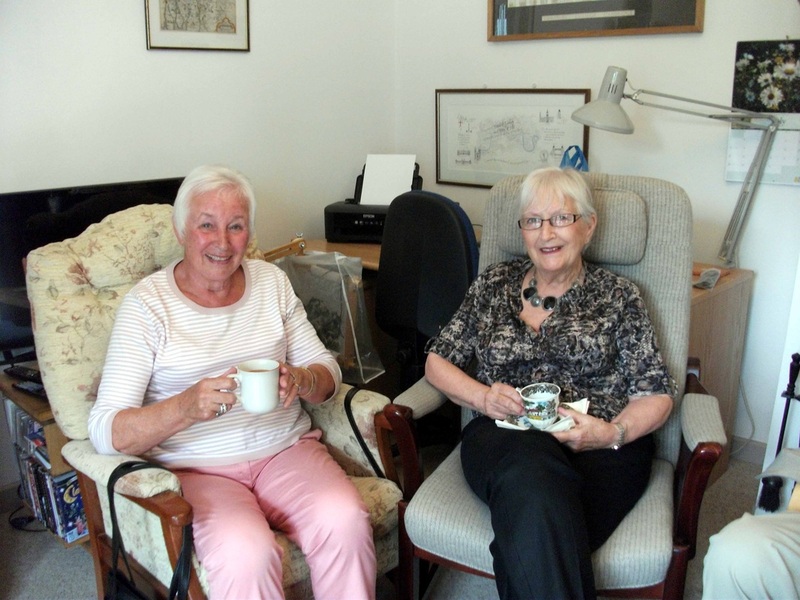 Our first fundraising event, on Friday 1 August, was a coffee morning at the home of Dori and John Ericsson, the Group’s Minute Secretary and Treasurer respectively. The magnificent sum of £643.00 was raised, and our thanks go to everyone who supported the occasion.